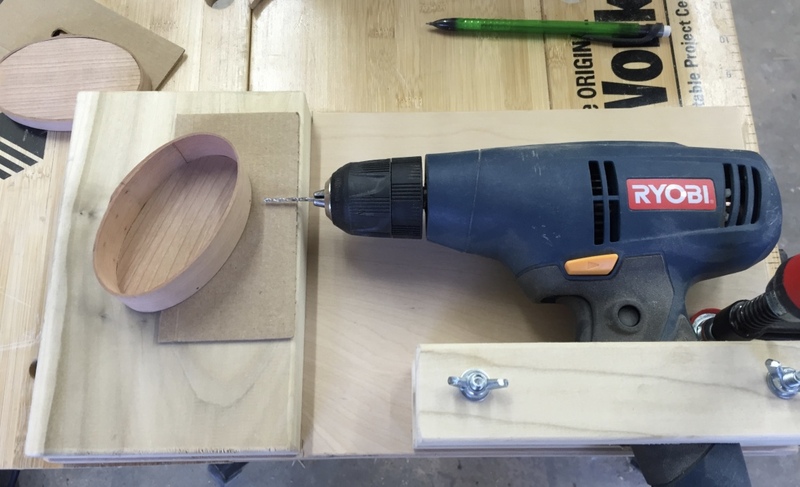 I’ve always wanted to make some Shaker Oval Boxes. I love a good challenge and learning a new woodworking skill. Back in May I attended the Early American Industries Association (EAIA) annual meeting which was held at Pleasant Hill Shaker Village in Harrodsburg, KY. In preparing for the meeting I figured a nice set of Shaker oval boxes would be a solid addition to the EAIA’s silent auction. 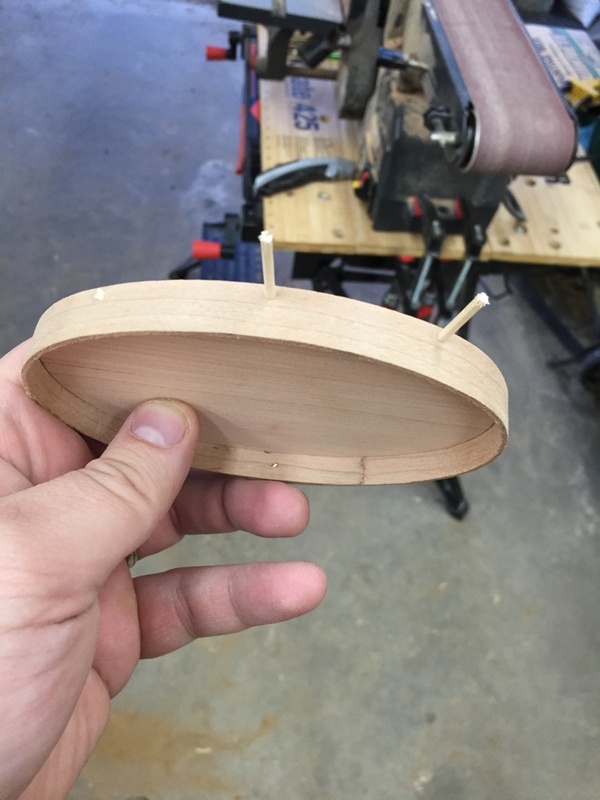 In order to gather up the correct supplies and learn how to make a proper oval box I reached out to John Wilson of Michigan who is a well known expert on making these boxes. First off I laid out the templates for all the bands I wanted to bend into boxes and box tops. For this project I used Cherry. Then I pre-drilled the holes for the copper tacks. 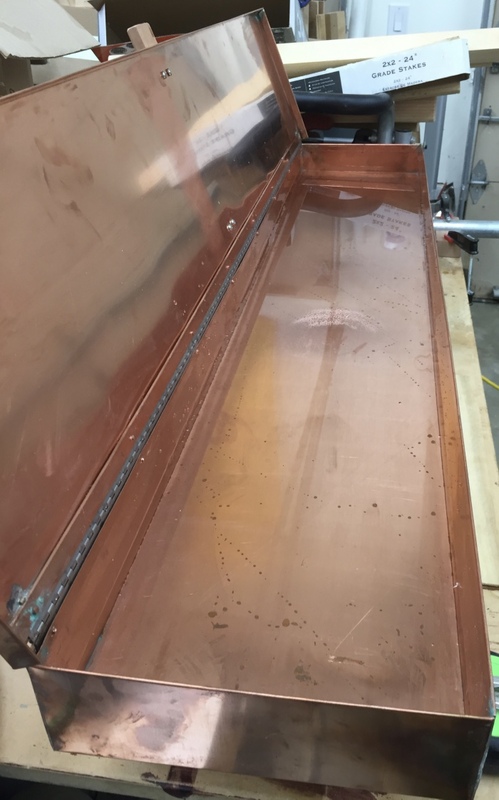 Next up was filling the copper steam box with water and heating it up. under the box is a double burner electric hotplate and blocks to keep the tray steady on the burners. When using Cherry you may also want to use distilled water as minerals in your tap water can leave some stains. I then steam the ends of the bands, cut the tapers in the end with the tack holes and feathered the other end of the bands on the belt sander. After letting the bands steam I pulled them out one at a time to wrap around the appropriate sized form and marking the overlap. Then remove it from the form and hold the band tightly in place at that same size marked while you take it over to the heavy round pipe anvil and clinch the tiny copper tacks in place to secure the band. This set of forms is a large block of basswood in the size and shape you want the box to be. 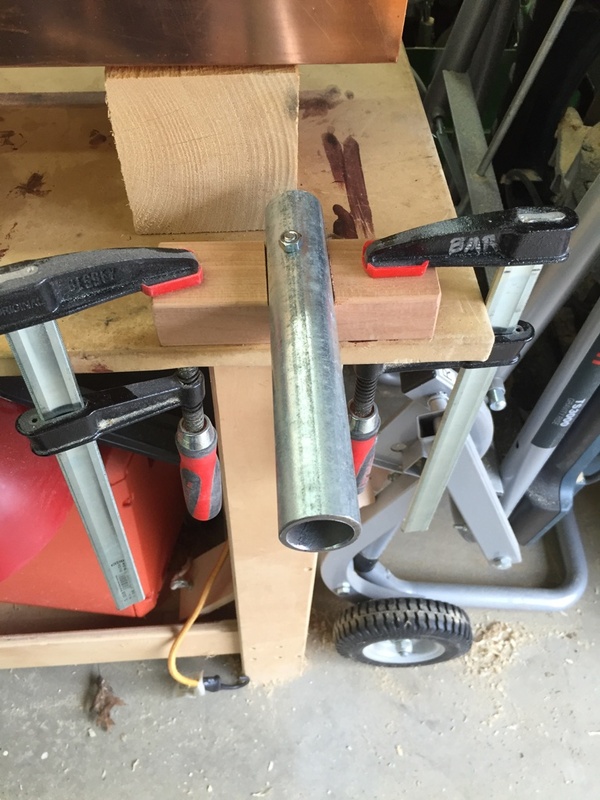 Bench mounted anvil for clinching the copper tacks. I had never clinched a tiny copper tack before so I grabbed a shim and practiced with a few tacks of each size on the anvil. After a tack or two you’ll get a good feel for it. I got a rhythm going and could feel/read how the tack was going in and move it on the anvil relative to my hammering to make sure I got the tack head nice and even with the surface and got a nice clean clinch on the inside. With the band tacked the next step was to get them over to the second set of forms to dry. 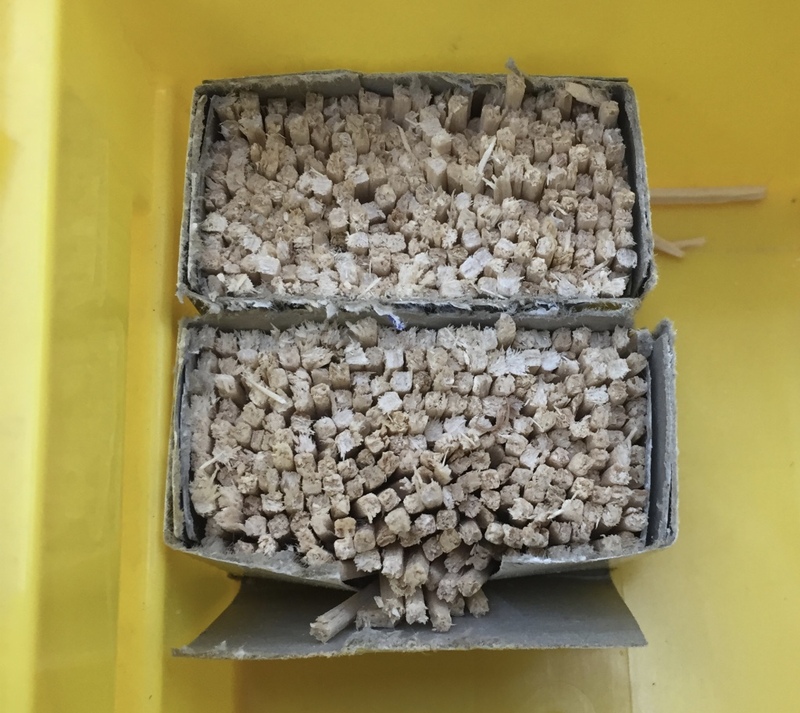 These forms are two blocks of wood also in the shape of the box, similar to the first form, but these forms have a tapered edge profile and holes to let air/water in and out and give your fingers a place to pull the forms out from when they are dry. 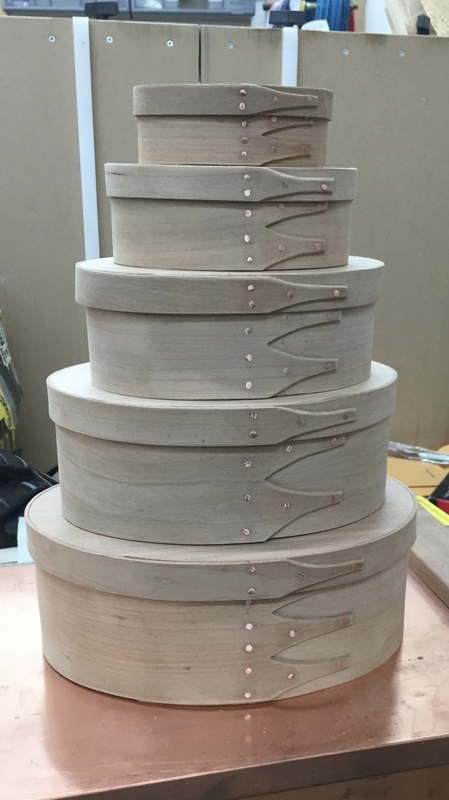 The bottom band is steamed, tacked and setup on the second set of forms. The top band is wrapped around the bottom band on the form. The goal is to get a nice tight fit and line up the tack holes. Let the bands dry for a day or two and then it is time to fit the tops and bottoms into the bands. 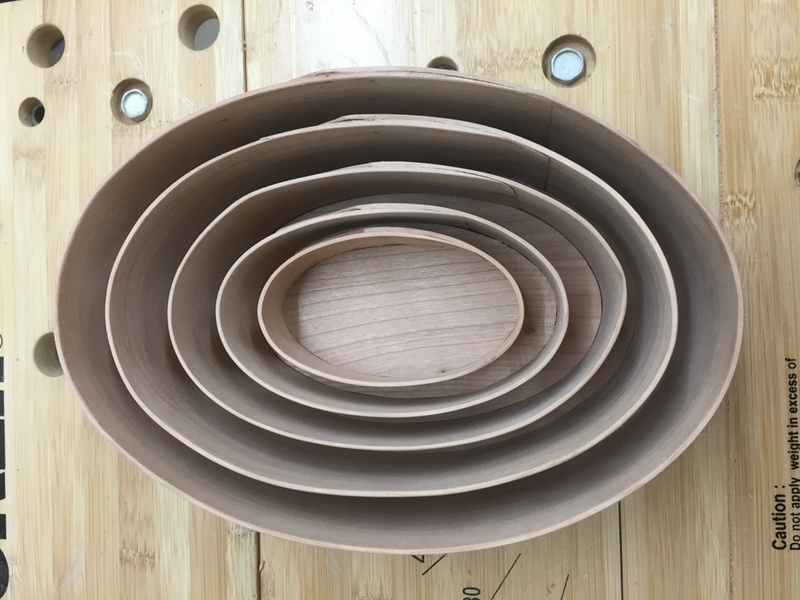 Trace your band onto the top or bottom blank, cut it near the line on the bandsaw and then use a fixed disc sander with the table set at a few degrees under 90 and sand them to shape and test fit as you go. You don’t want any gaps or spaces between the band and the top or bottom. I got all the tops and bottoms fitted before moving on to the next step. Next up was testing out a special drilling jig to make pin holes for attaching the tops and bottoms to the bands. There is no glue in these boxes. 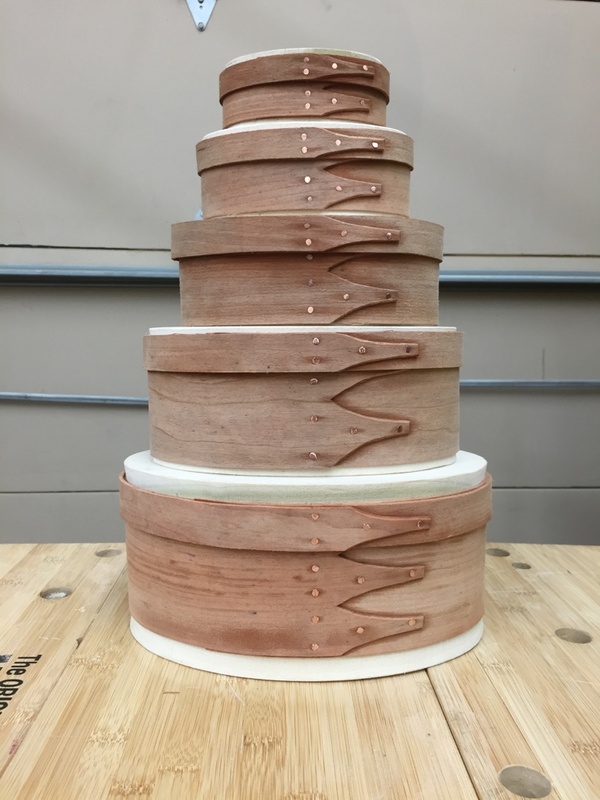 The pins that will secure the bands to the top and bottom blanks are made from hardwood toothpicks that are cut in half on a band saw. I made pencil dots where I wanted the pins to be, fired up the drill in this jig and made all the pin holes. For very tiny boxes with thin tops and bottoms I made a tape loop out of blue painters tape and taped some thin cardboard onto the face of the jig to center the holes in the thickness of the top or bottom of the box. 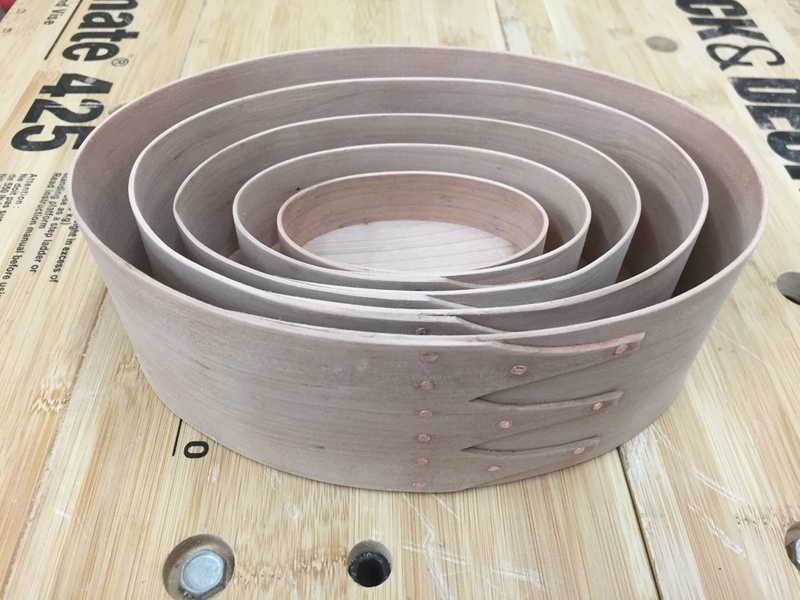 The pins are then tapped into place, clipped off and then sanded on the belt sander to remove any protruding pin left and make sure the bands are level with the tops and bottoms. The boxes nest inside of each other similar to a Russian Nesting Doll. This made it easier to bring 5 boxes on the very long, and very full car ride from NH to KY with my wife, two babies and me. At this point the boxes all have a bit of a dull fuzzy look about them. I gently hand sanded all the boxes and made sure the top and bottom fit the way I wanted. They should have a nice snug fit, but not too tight nor too loose. All the corner edges, and inside and out of the box get a final sanding and cleanup. Then time for the finish. I applied Tung Oil to the boxes to bring out the grain in the Cherry and finished it off with a couple of coats of amber shellac. Each box is also signed, dated and notes that they were part of the 2016 EAIA annual meeting. 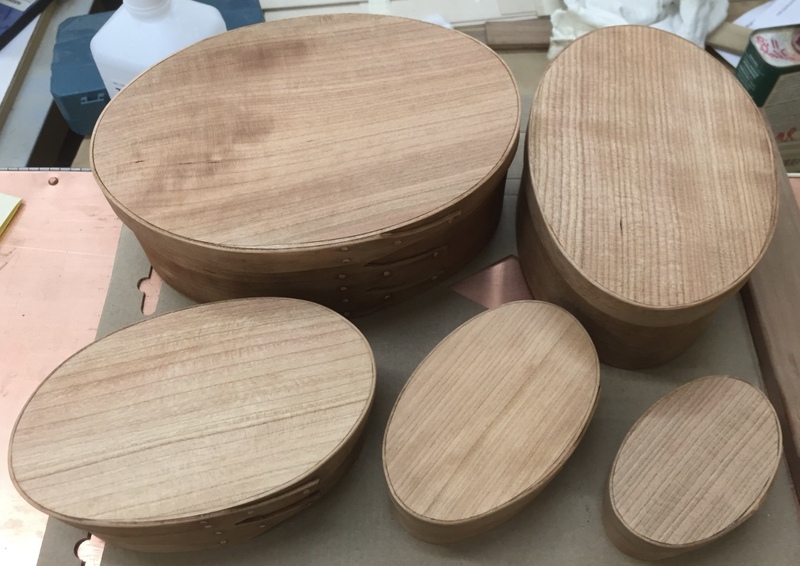 I was very pleased with how well the boxes turned out especially given this was the first time I ever made shaker oval boxes. 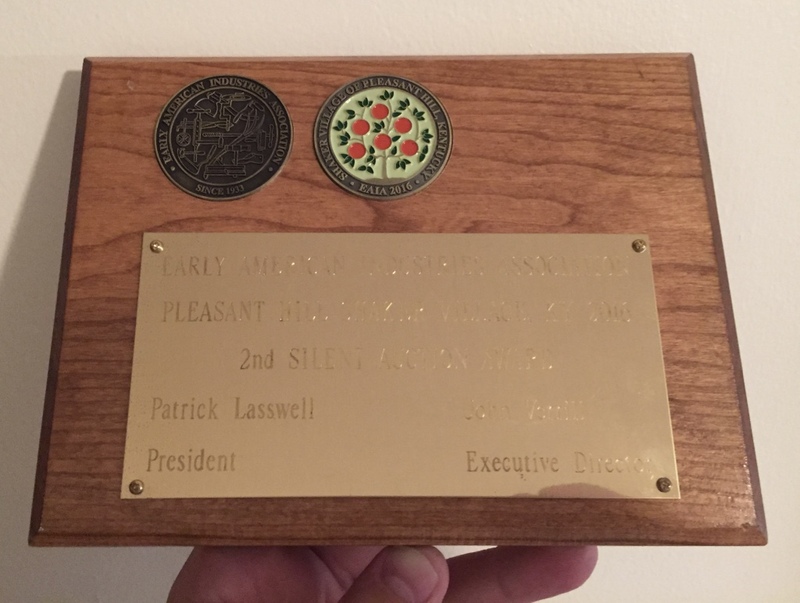 I was also glad to hear EAIA members also liked them as my set of boxes in sizes 0-4 turned out to be the second highest grossing item in the EAIA silent auction and I was humbled to receive the plaque below. I know they went to a good home, the home of Judy and Bill McMillen of Eastfield Village and Richmond Hill fame and good friends of mine. I’m also happy to report I was able to win the auction for some of the items Billy made as well including a Tin-Smithed dustpan my wife and I both had been wanting for a while when we saw one that Billy made at a prior event, but that is a post for another time. I had a great time making the boxes and we all had a great time at the annual meeting. I had wanted to visit Pleasant Hill Shaker Village for a long time and I’m glad I finally got to see it and spend the better part of a week living in the village. 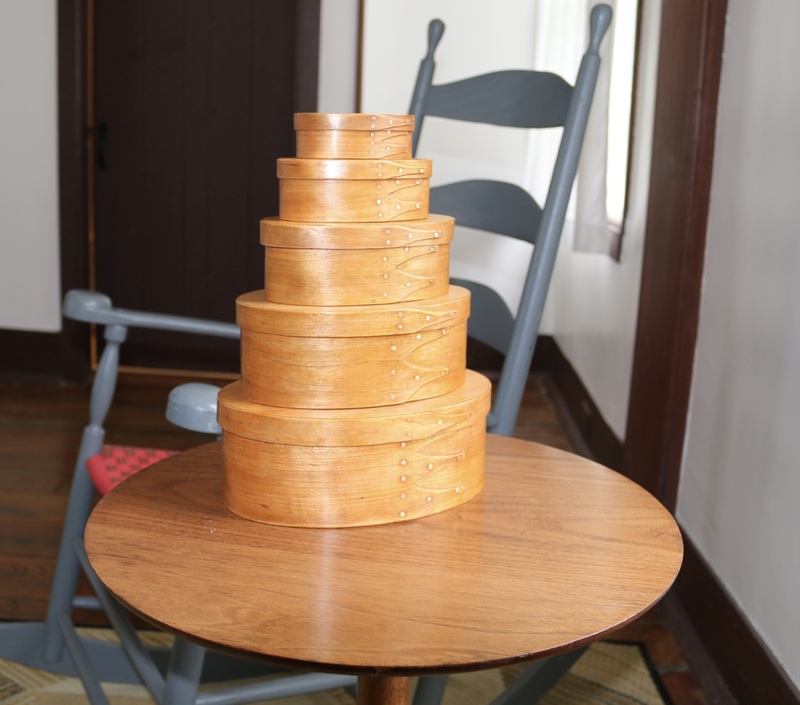 If you’d like to make some Shaker Oval Boxes of your own, please check out the link to John Wilson’s website below along with links to more information on Pleasant Hill Shaker Village and the EAIA. It’s always fun to travel back in time. This past weekend I traveled back to the 19th century as I participated in the Early American Industries Association Historic Trades Sampler Program at Eastfield Village. 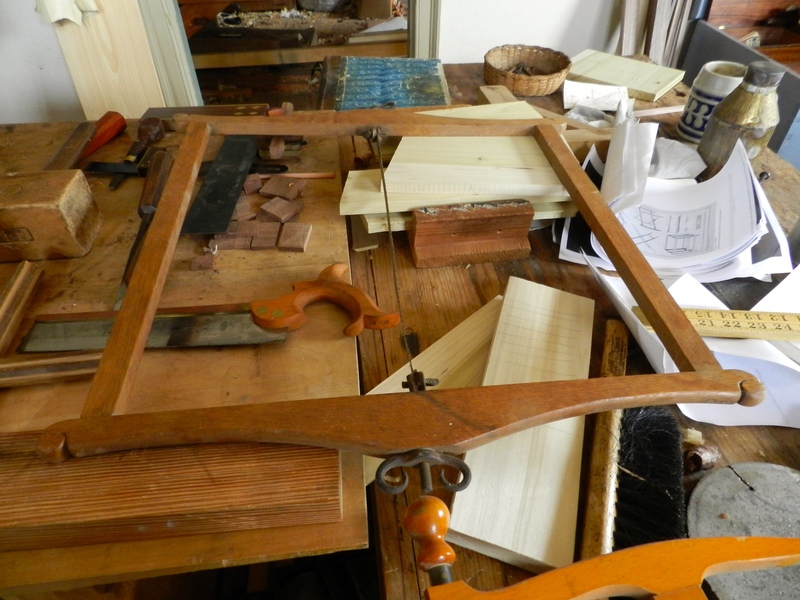 On Saturday I taught a workshop on the use of traditional molding planes to make a picture frame. In this post I’ll cover some of the highlights of the course and share some details for folks who might want to give it a try at home. 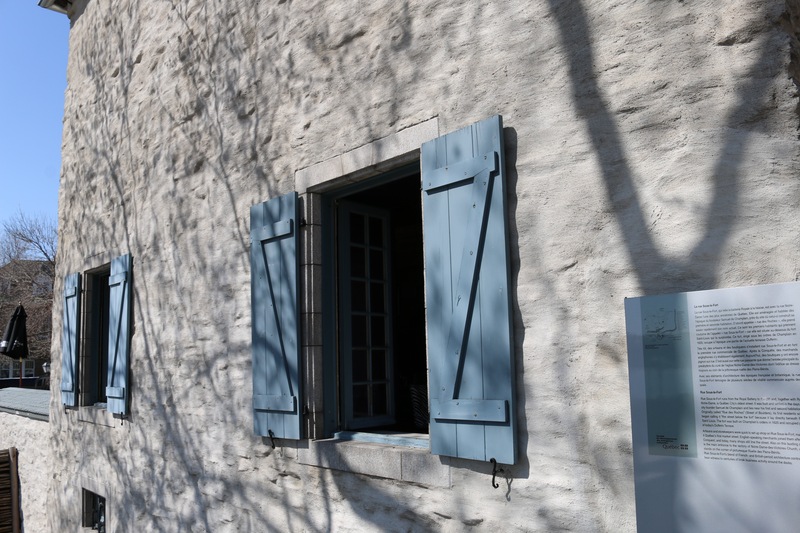 One of the joys of an event at Eastfield Village is to work by natural light in a beautiful and immersive setting — in this case Don Carpentier’s village of carefully moved and restored historic buildings — taverns, trade shops, homes and outbuildings. 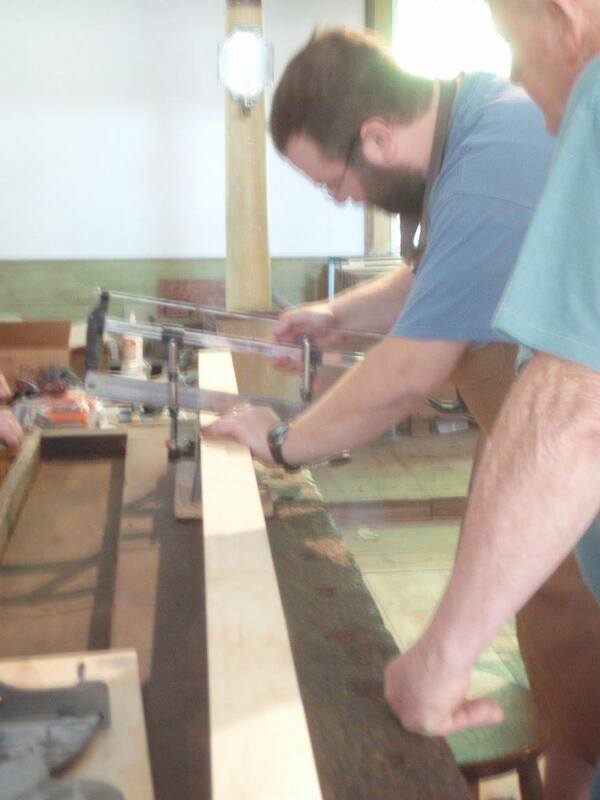 Brian and Tom working with the molding planes. After an orientation to the tools and classroom setup I demonstrated how to evaluate a molding plane and how to tune up an iron. We also talked about the wide variety of profiles that can be created from even a very modest set of molding planes. 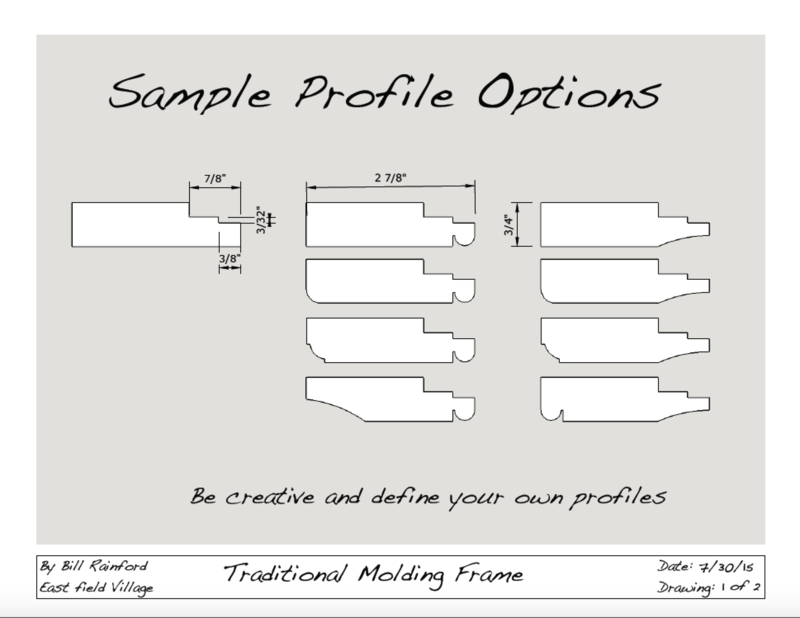 The profiles below can be created using a beading plane, a pair of hollows and rounds (say #8) and a rabbet plane. A sampling of how a few simple profiles can generate a large variety of frames. And with hollows and rounds the profiles are only limited by your imagination. Students tuned up their planes, squared up their stock, and tested their plane setup on some scrap and set about making the stepped rabbet needed to hold the glass in place and the plywood back. The plywood back is carefully screwed in place and helps created a very solid/rigid frame compared to the floating backs held in by stamped metal retainers we see on many modern store bought frames. The long piece of plywood with an MDF fence and screws at the end to secure the stock is called a ‘sticking board’ and can be as long or as short as your project stock requires. Don making a profile on the edge of his frame stock. Next up students started molding their chosen profile(s). We talked about how to work backwards withe the molding planes building on the work of an earlier swipe, how to adjust irons as needed and how to get a nice finish on the profile. 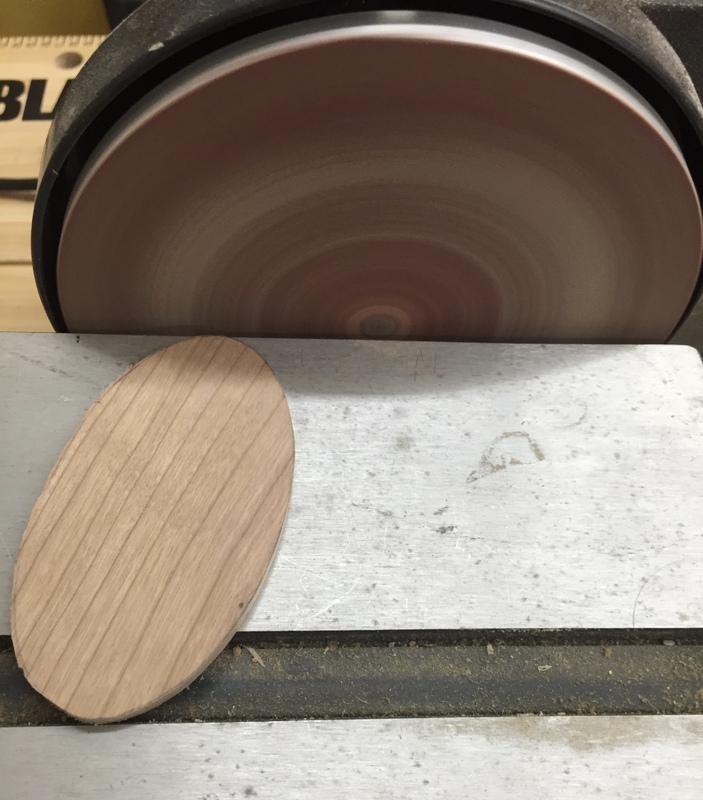 With a fully molded piece of stock now it was time to layout your cuts and cut the miters. 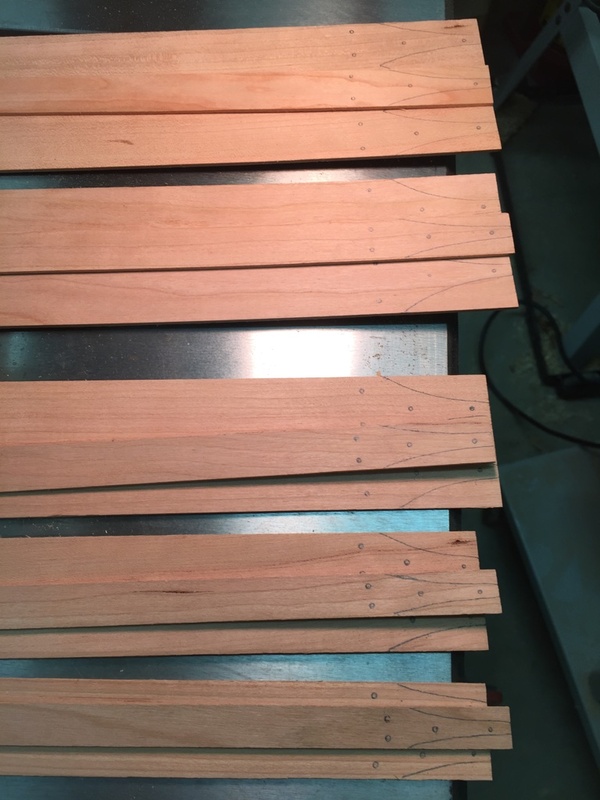 In this case students left the line knowing that we could creep up on it by using my Lion Mitre-Master (large metal frame-makers guillotine) or a shooting board with 45 degree insert to clean up the corners and ensure we have a nice tight miter at each corner. With the woodworking complete, next up was a test fit in the band clamps and then final gluing of the frame. While the frames baked in the clamps it was time to cut the glass to size and test fit it. We did this with a self-oiling glass cutter and a layout I made on the bench. Once the glass was fit it was time to layout and countersink the plywood back which was made if 1/4″ thick Baltic birch plywood and secured with #6 1/2″ waxed screws. We used bit braces and egg-beater drills to make quick work of this step. Hanging hardware came in the form of a self leveling hanger (Think saw-tooth that hangs on single nail) which is affixed with two tiny brads. 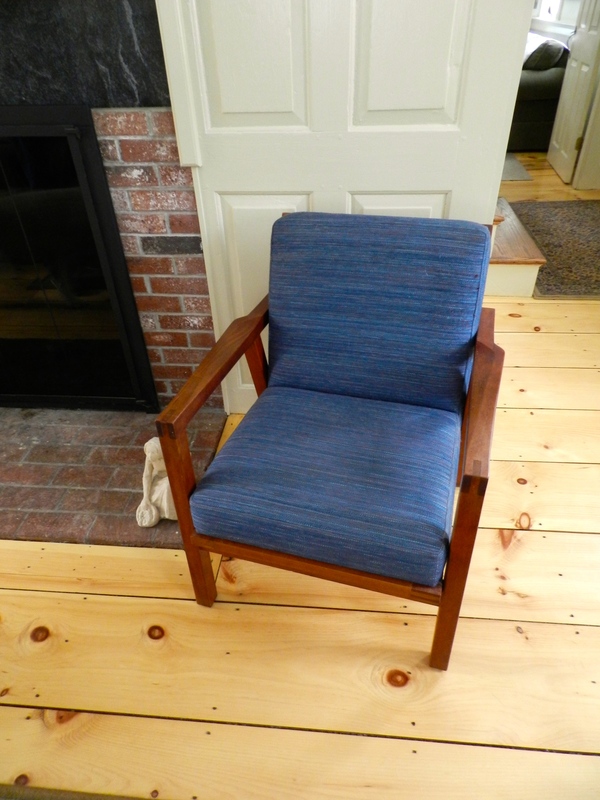 An appropriate finish would be stain and shellac or a nice bright milk-paint. Tom with his finished picture frame. I’m happy to report that everyone in the class was able to complete their frame, and I had a great time working with Tom, Don, Carol and Brian. (Carol I’m sorry that I didn’t have any photos of you working to add to this post, but I did make use of some of those photos of me you share with me — thanks again) . If you’d like to make a frame of your own the plans I put together for this workshop can be seen and downloaded from the link below. The seemingly odd size of this frame was dictated by two factors — the smallest size glass I can get at my local home center is 10×12″ so if you cut it in half you wind up with two 6×10″ pieces which allows each student to have a spare in case their glass cutting didn’t go well and they need a spare or they find time to make a second frame. The size is also dictated by the sticking board and stock. I wanted something that would fit on the 8′ sticking boards I had and allow some extra space in layout and for cutting and to have a bit for testing/trial. 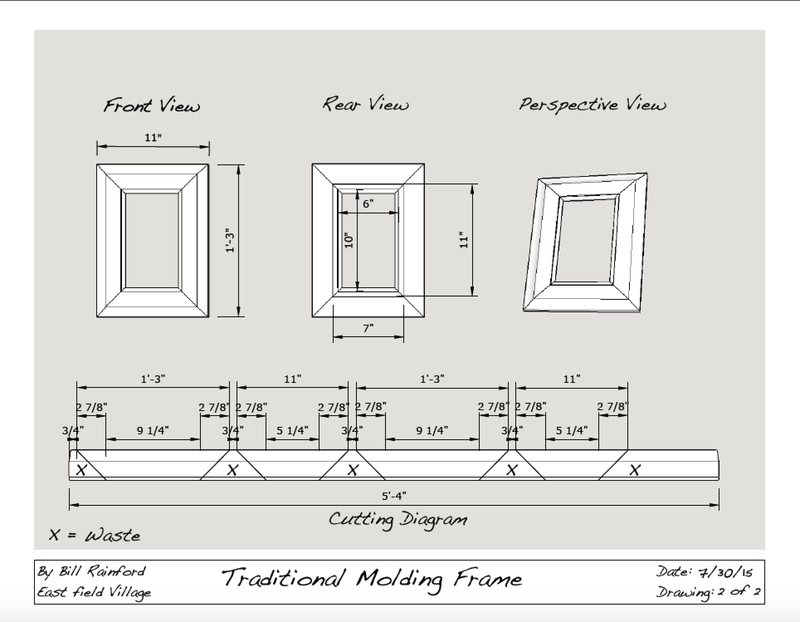 The plans below could be scaled up or down to fit whatever size frame you desire. Click here to download PDF Version of the handouts I made for this class. If you make a frame of your own and take some photos of it, please share it in the comments below. 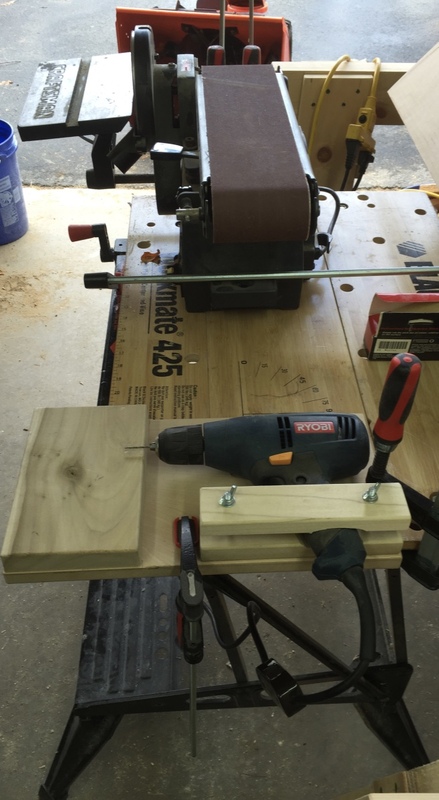 It’s a great project that can add some unique personality to your pictures and add valuable skills to your woodworking repertoire. 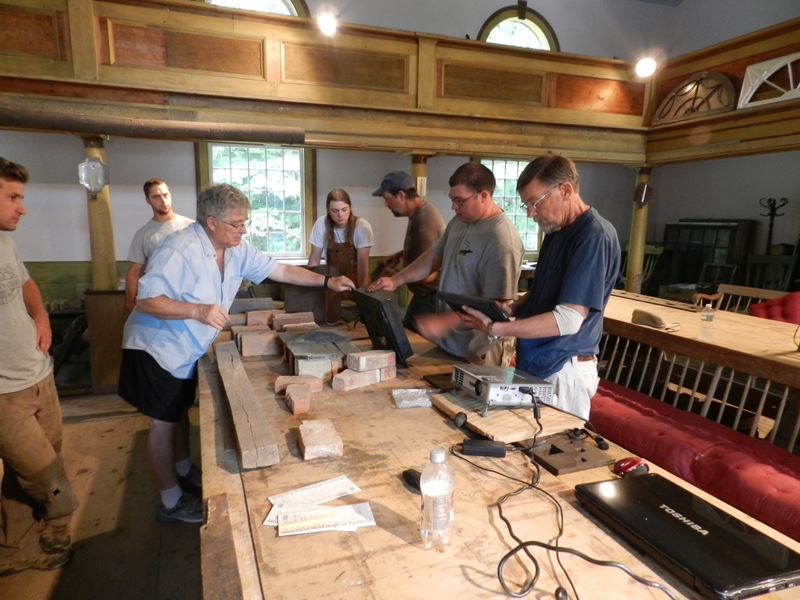 This summer I’ll be teaching a workshop as part of the Early American Industries Association (EAIA) ‘Historic Trades Sampler’ at Eastfield Village. Flint knapping & arrow making with George Lott. The name ‘Eastfield Historic Trades Sampler’ reflects what is being offered –a sampler of various trades- with an opportunity to learn about them while completing a small project related to the craft. There are two different workshops each day from which to choose. The classes start at 9 a.m. and there is a lunch provided in Eastfield‘s historic tavern from noon until 1 p.m., at which time the afternoon session of the workshops resume. The workshops end around 5 p.m. The official flyer can be found here. 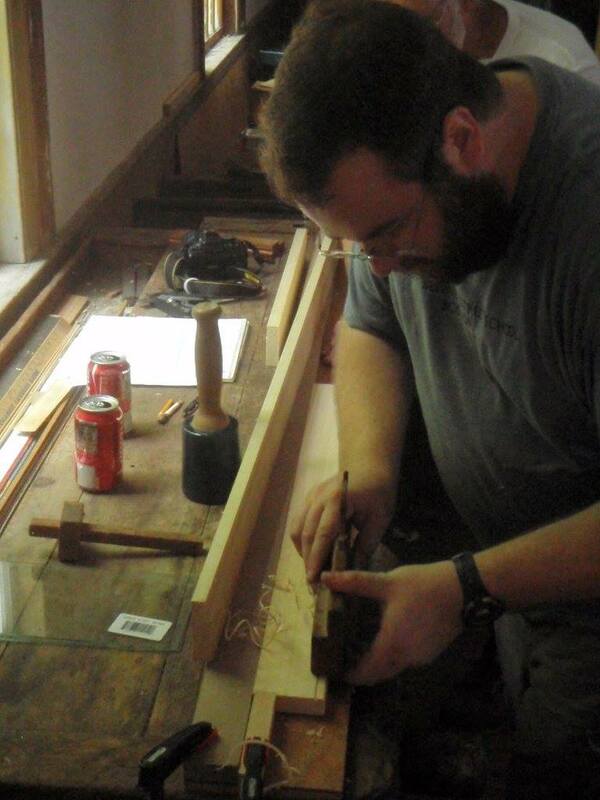 I’ll be teaching a lesson on running traditional moldings using traditional hand planes. 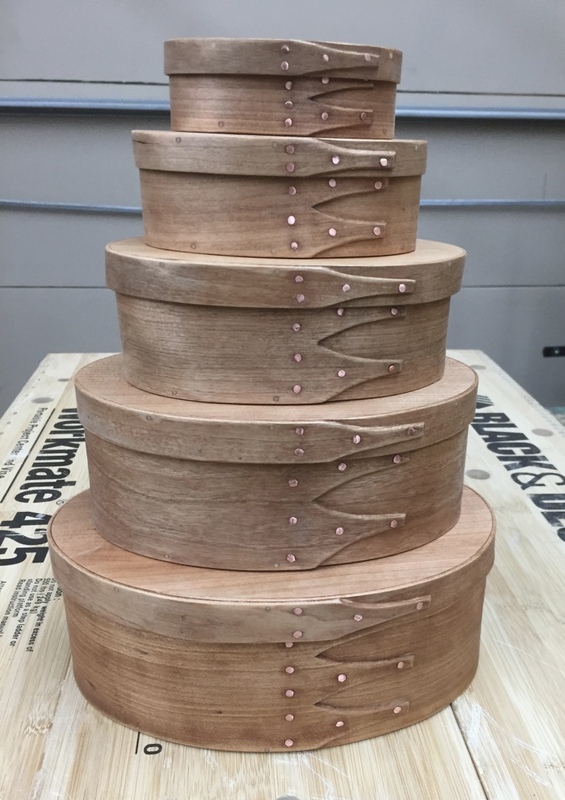 Each student will have the opportunity to setup and use some hollows and rounds, beading planes, rabbet planes and molders on a sticking board to make a short run of molding that will be mitered to form a small picture frame. If you’d like to learn a bit more about this sort of work please check out this earlier post as well as this one. Eastfield is a village of historic buildings that Don Carpentier brought to the east field of his farm in East Nassau, New York, over a period of forty years. 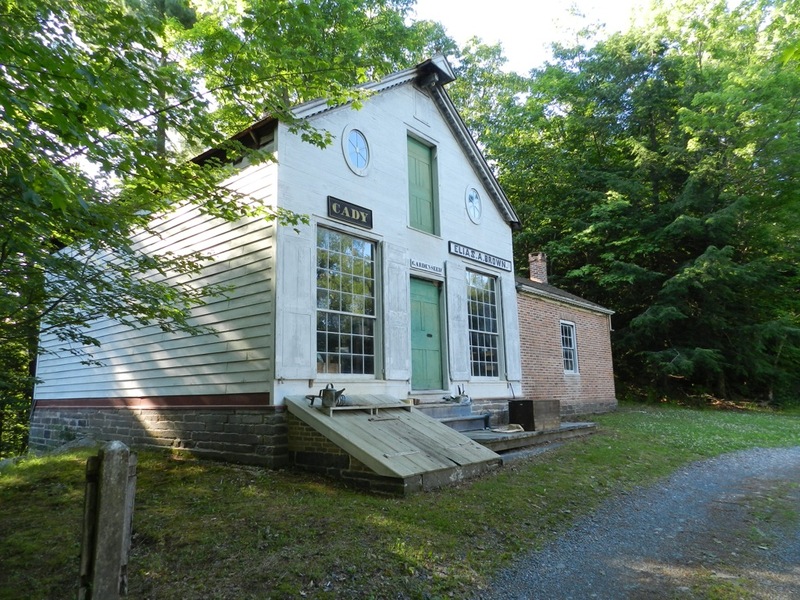 The village is used as a hands on preservation lab and students can explore the village, handle period objects and learn a lot in a short period of time. Students are welcome to stay in several of these buildings which have been restored to their 18th and 19th century appearance; however there are hotels and other accommodations nearby. Learn more about Eastfield Village here. Accommodations in Eastfield‘s taverns are available free of charge for those wishing to stay as guests in early 19th century accommodations. The only requirement is that each person supply their own bedding, plus 10 ten-inch white candles. 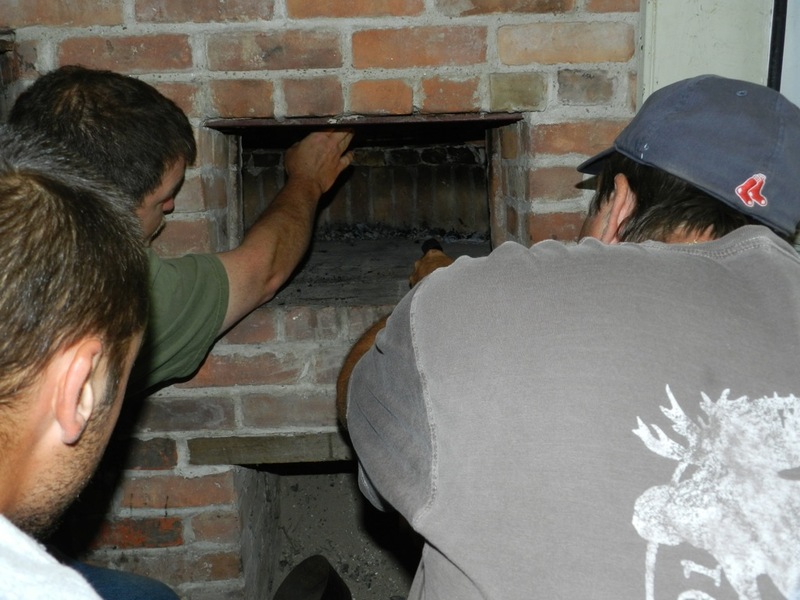 Students who take classes at the Village are encouraged to stay here during the Historic Trades Sampler. 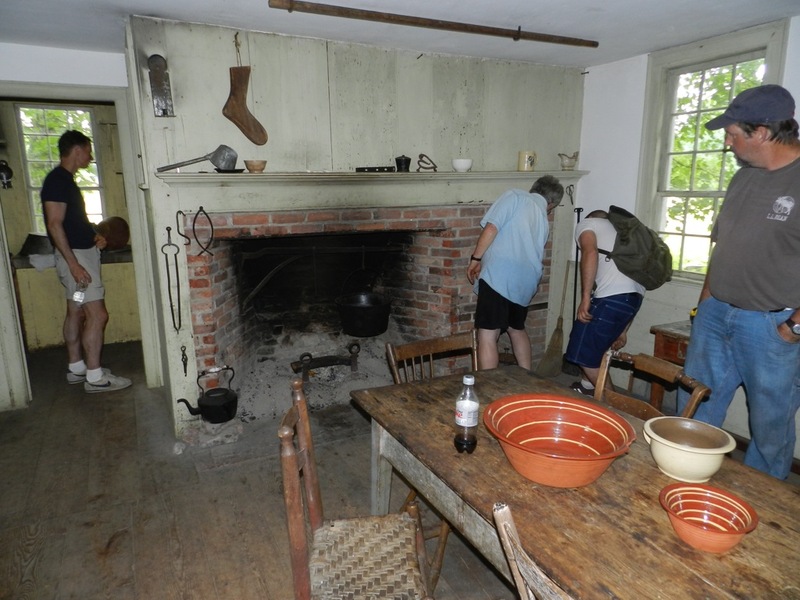 Meals may be cooked or served in the late 18th century kitchens. Accommodations are rope beds with straw and feather ticks. Facilities are located in period out houses (and there is a modern porta-john, and a running hose should you need those slightly more modern comforts ). 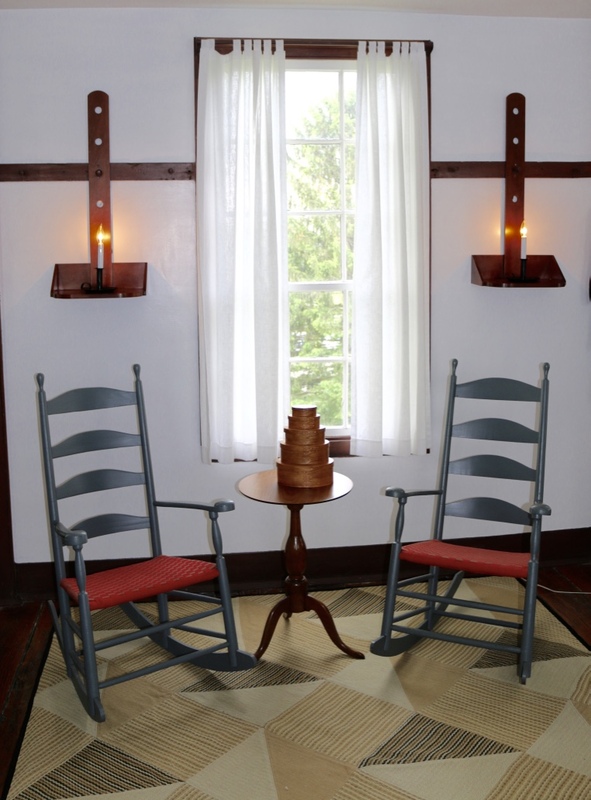 There are evening gatherings in the Briggs Tavern and lively conversations and games of dominoes by candlelight. 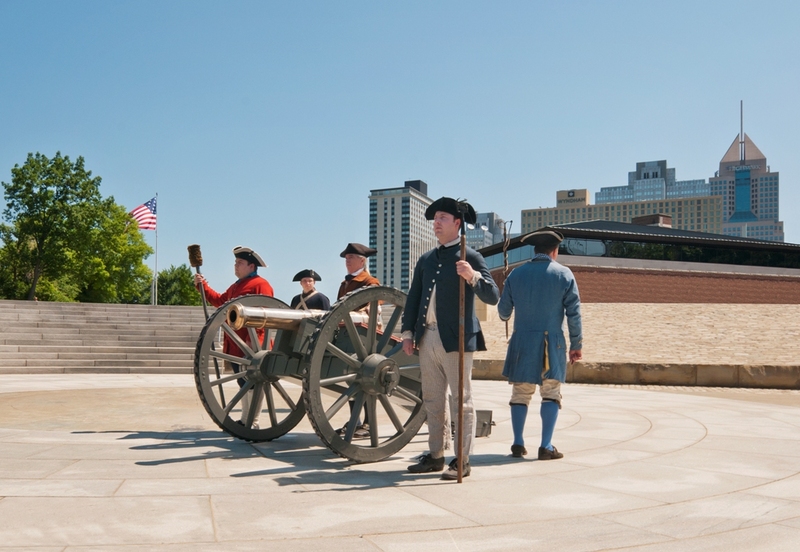 This immersive experience offers an unforgettable opportunity to be with others – students and teachers – of similar interests, to gain an appreciation for the work and daily life of early 19th century America. Don’t forget to Register Today! 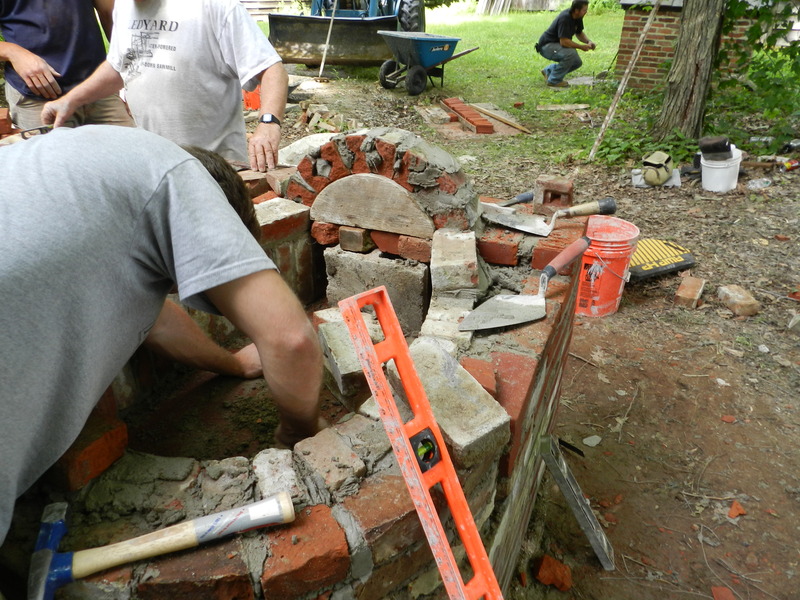 This is an great opportunity to learn and practice historics trade using traditional tools! I hope to see some of you at Eastfield this year. You can register for the event on the EAIA website here. If you have questions, feel free to ask me in the comments or via the contact page for my blog. As a Joiner and a Preservation carpenter I always enjoy studying interesting architectural details. 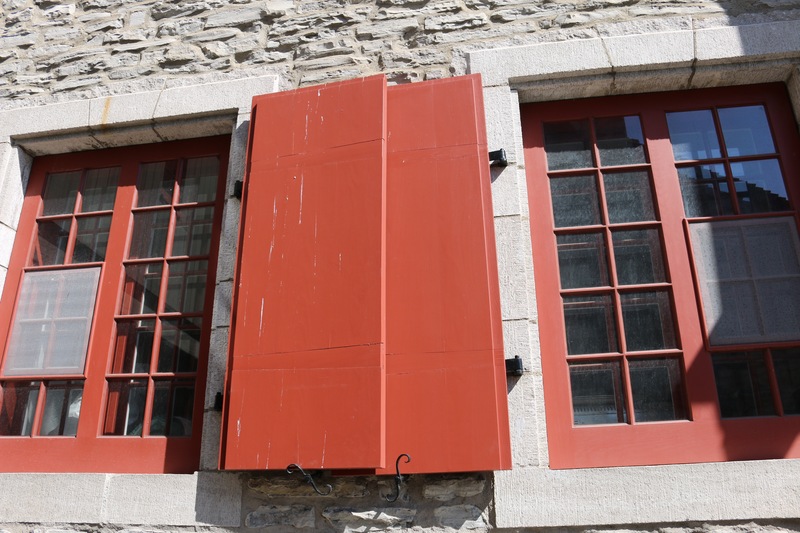 On a recent trip to Old Quebec I found a lot of interesting French influenced shutters that I wanted to share with you. 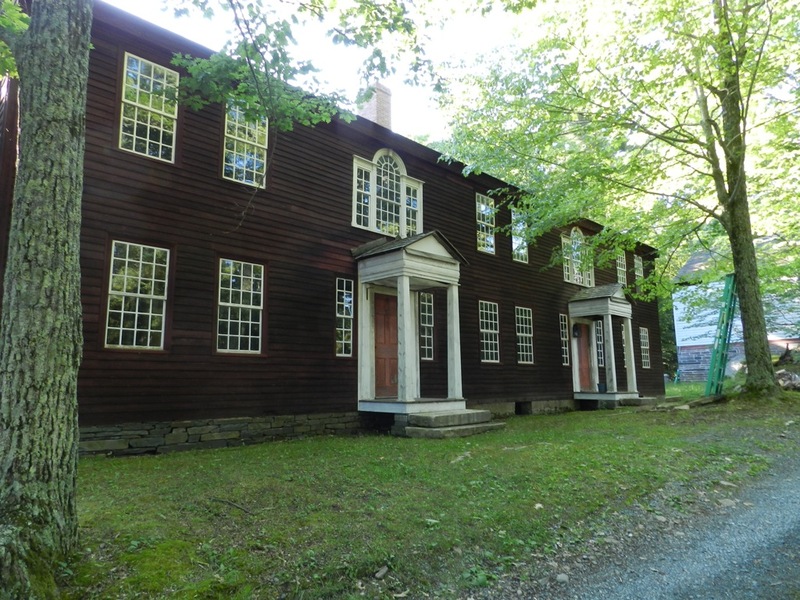 Living and working in New England and the mid-Atlantic the majority of what I come across are English, Dutch and some German inspired shutters. 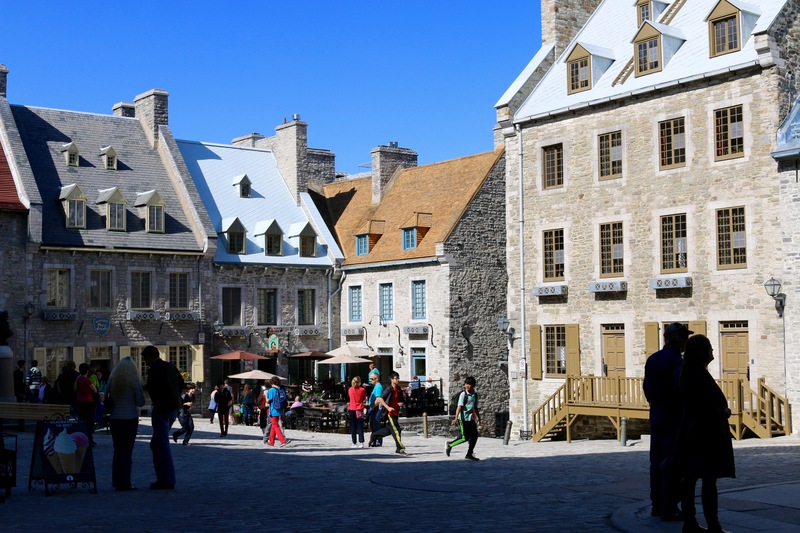 In Old Quebec many of the buildings date to the 17th and 18th centuries. Shown below is a great example of a board and batten (or sometimes called a ‘ledge’) shutter with ‘Z’ bracing. I like how the ‘Z’ brace was properly let into the batten (horizontal member). 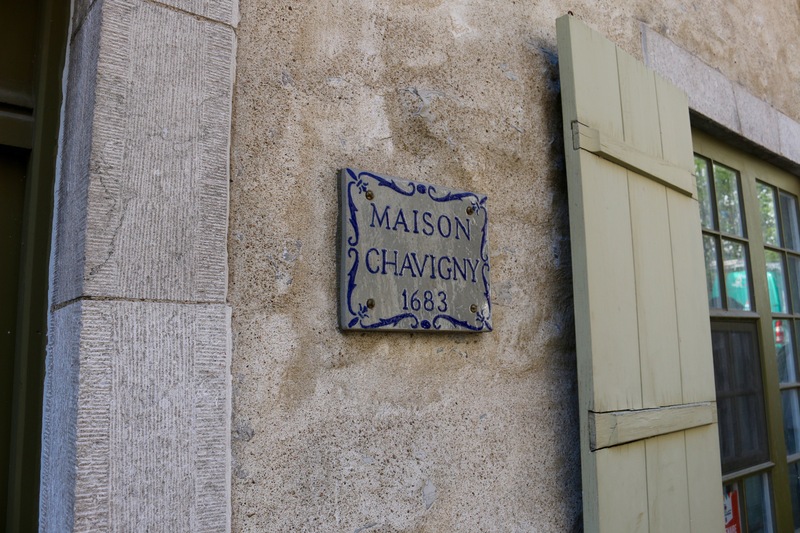 What was unusual to my eye was how the the nails used to clinch the boards to the batten were relatively large nails and relatively few in number compared to English versions of this type of shutter. 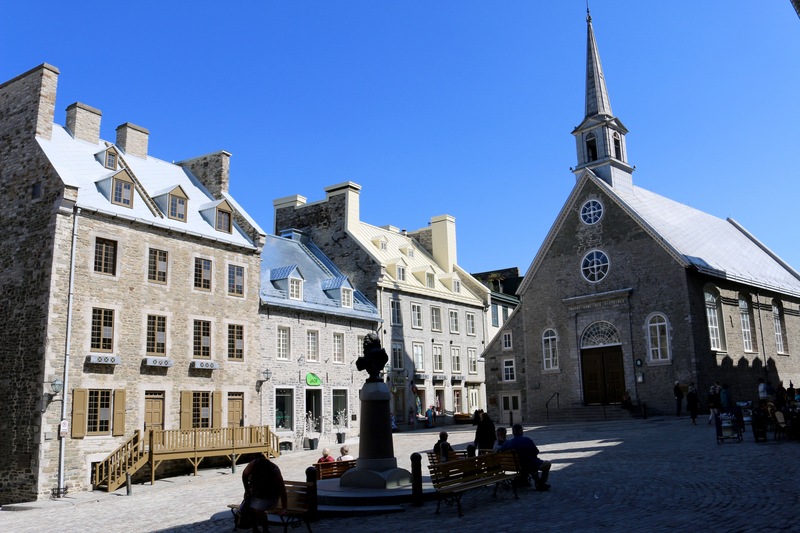 Wandering around Place Royale Square you can visit many beautiful and historic buildings. 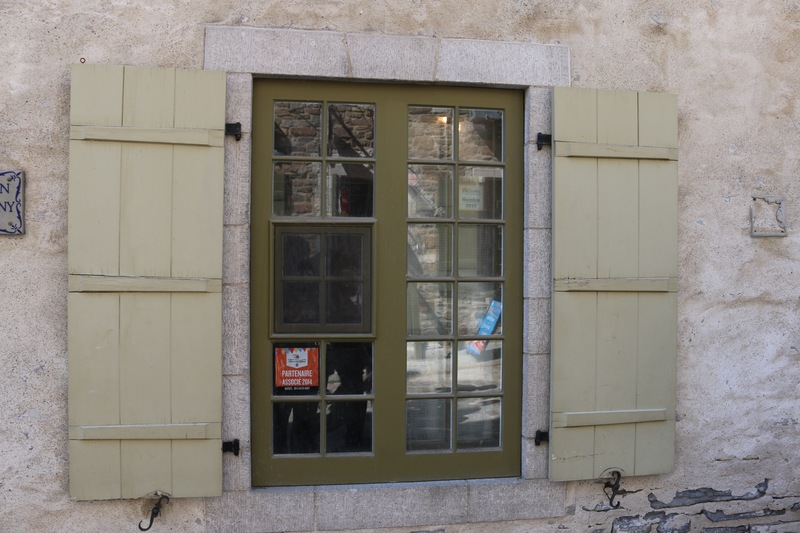 The earlier 17th century French buildings had smaller panes in the windows and the 18th century English buildings had larger windows with larger panes as technology advanced and styles changed over time. 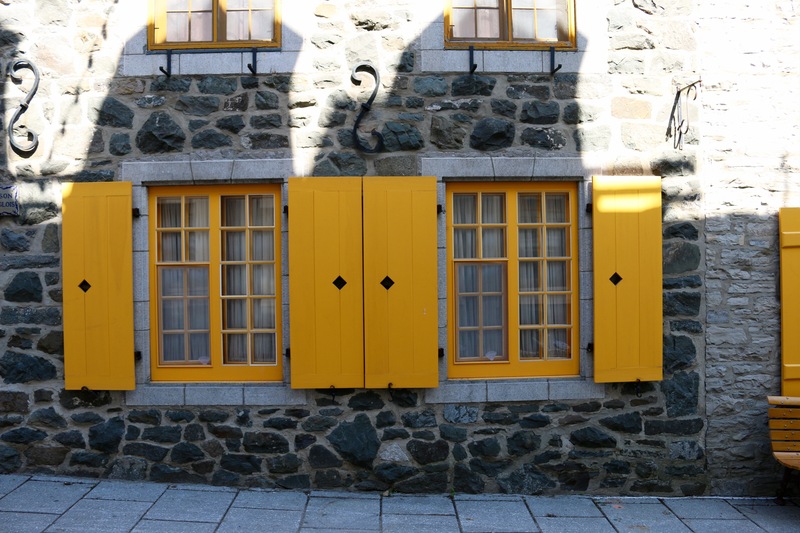 These beautiful bright yellow shutters had nice breadboard ends and decorative cutouts to dress up the otherwise relatively plain look and let in a bit of light so occupants could tell if it was day or night from inside the building. On this building the shutters also sport breadboard ends to help keep the vertical boards flat. These shutters were made from particularly thick stock and the outer edges are also fielded a bit which adds a nice detail and likely helps the shutter sit flush when closed. 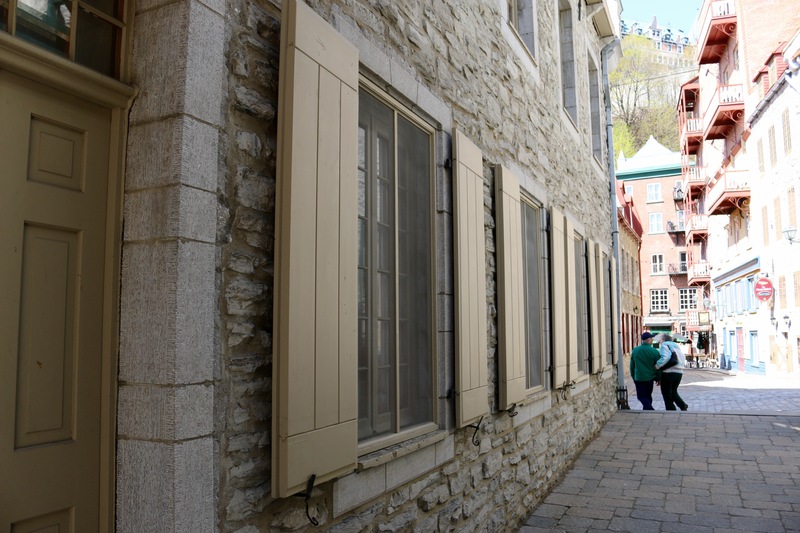 Wandering around Place Royale Square there were many great buildings to admire including some with traditional raised panels but we’ll skip those English style shutters since we’ve talked about them before in other posts. Here is were things really started to get interesting for me. The building shown here has tapered sliding dovetail battens to help keep the boards flat. A shutter is exposed to extreme conditions of sunlight, heat, weather, cold etc which will cause the boards to move a lot with the seasonal changes. If you look carefully at the photo above you can see how the sliding dovetail allows for that seasonal movement without any metal hardware to secure the batten to the boards. Also note how the middle batten is tapered the opposite way compared to the upper and lower battens. This helps keep the battens and boards flat and keeps the boards from sliding off the battens. In another part of the city we saw the same style of tapered sliding dovetail battens that are flushed with the rest of the shutter. If you look carefully at the paint lines you can see how the battens were set into these nice thick boards. On that same building was a very nice butted panel door with a large transom above it that I had to share with you. Again the lines are very neat and plan, only dressed with a simple V-joint to accentuate the defect of the narrow panels meeting the rails and stiles. 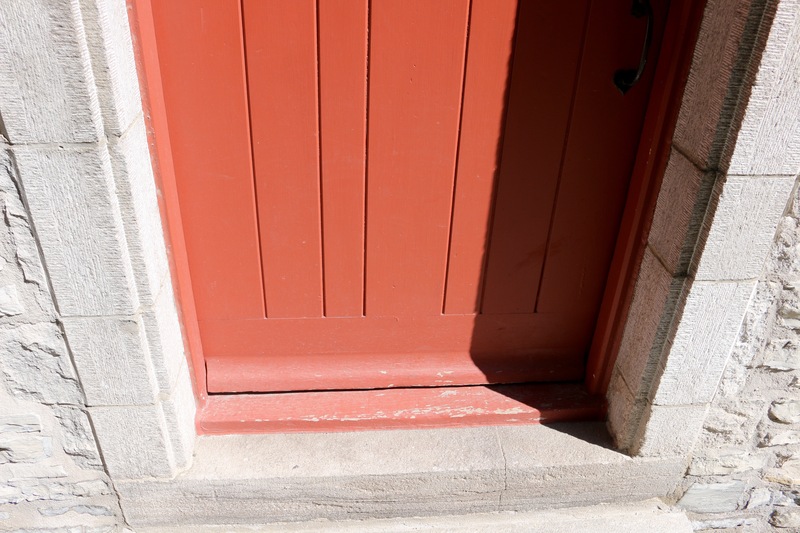 What really grabbed my eye was this detail on the bottom of the door that helps she snow away from the threshold during the harsh Quebec winters. This year in Boston we set local records for getting 10+ feet of snow this year. When talking to folks in Quebec they said they had over 20 feet of snow! So with larger snow piles reaching up to your door this detail presumably will help keep some of the snow from getting in. It was great to see some architectural details that were uncommon to my area. If you live in an area with interesting shutter and door details, please share them in the comments. P.S. 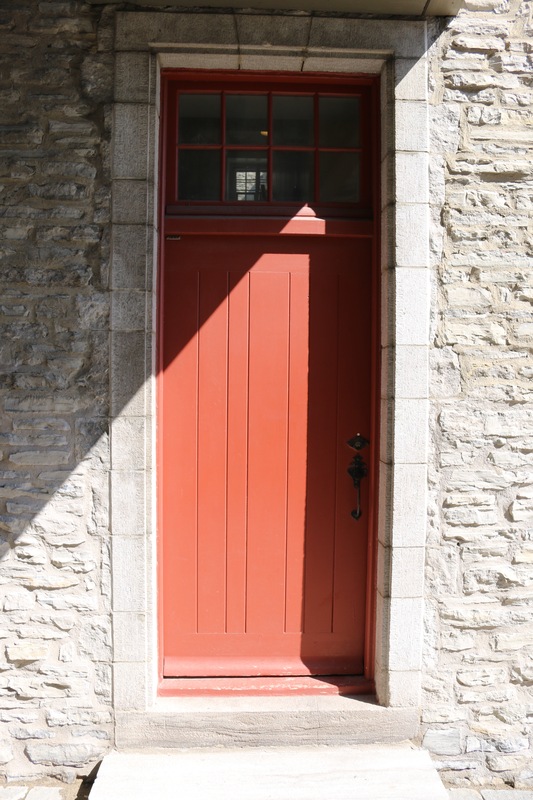 If you want to learn more about traditional New England and Mid-Atlantic style shutters you may want to check out this earlier post here or an upcoming session of that workshop. During the course I talk about stylistic and regional variations we have here in New England, New York and Northern Virginia. 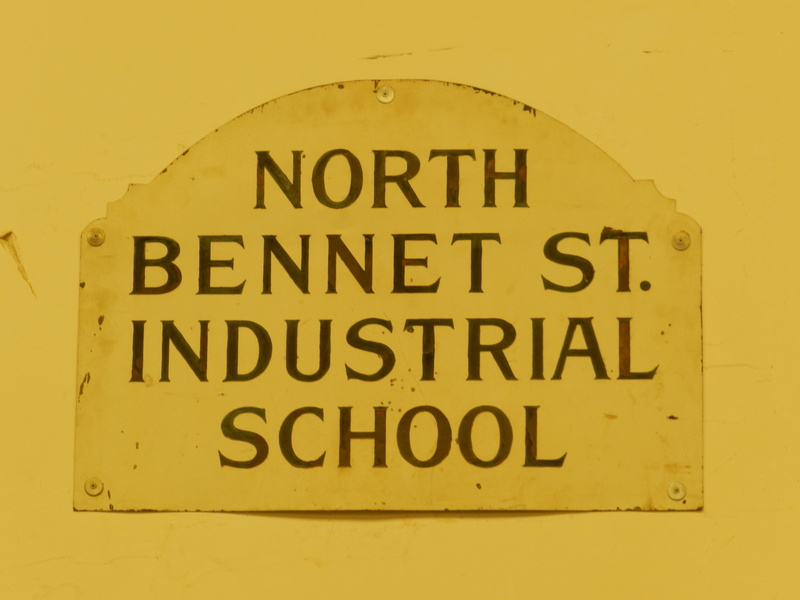 One of the lessons I learned while I was a student at the North Bennet Street School was an appreciation for quality hand tools and the superior work they can help produce. A hand tool that works well and feels good in the hand can be a joy to use — and all the better if that fine tool is also easy on the eyes. Many hand tools on the market today mimic or improve upon the designs of earlier tools. I love my Lie-Nielsen planes and chisels which take advantage of newer materials and manufacturing techniques and produce traditional tools that look great and work even better. A few makers have been a bit bolder with their designs and use of manufacturing technology — some of the new Veritas planes like the side rabbet or custom planes, Knew concepts coping saw and Woodpecker’s line of one time tools among others. When I think about tools that are pushing the envelope in terms of design, use, manufacturing quality, and aesthetic appeal, John Economaki’s work is at the top of my list. If you are not familiar with John or his work, he founded Bridge City Tool Works in 1983 and like a fine micro-brewer has been making small batch runs of incredible tools ever since. Given the small production runs these ultra premium tools have been a the higher end of the market and are popular with woodworkers and collectors. I’d love to buy every tool he makes if I had the budget to buy them all, but even one or two in your tool chest will be a delight to look at and use on a regular basis. 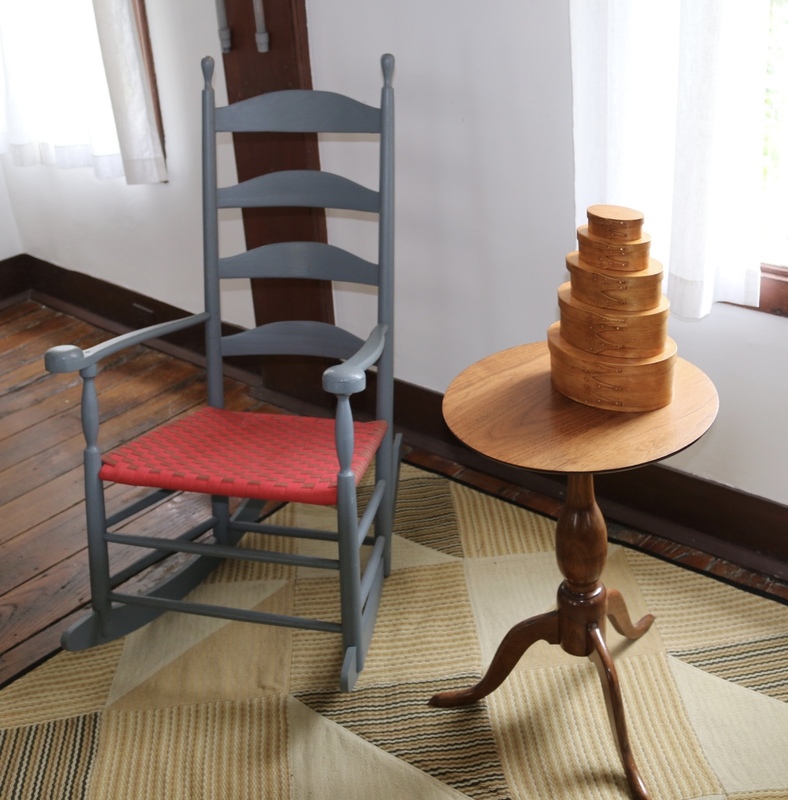 If you live in the Pacific Northwest you can see some of John’s toolmaking prowess and furniture making skill at the “Quality is Contagious: John Economaki and Bridge City Tool Works” exhibit which is currently at the Bellevue Arts Museum in Bellevue Washington. The exhibit will run through February 1, 2015. (The exhibit was curated by Nicole Nathan in collaboration with Economaki and formerly seen at the Museum of Contemporary Craft in Portland, Oregon) and is a celebration of John’s work and dedication to quality. If you are like me and live in the Northeast, do not despair — this exhibition will also be making its way to Boston in the new year. I am happy to report that the North Bennet Street School in Boston will be hosting this exhibition the late spring of 2015. You can learn more about the exhibit at NBSS and tool here along with a personal appeal from NBSS President Miguel Gómez-Ibáñez here. Admission to the exhibit will be free and it will surely be a inspirational experience for both craftsmen and patrons of the arts. Now here is the part where NBSS needs your help. Exhibitions are costly and, as a non-profit, the school has to raise $20,000 in funds to cover the installation, travel expenses and insurance. To help underwrite the costs, John Economaki designed a limited edition TS-1 Try Square (see photo above and below). 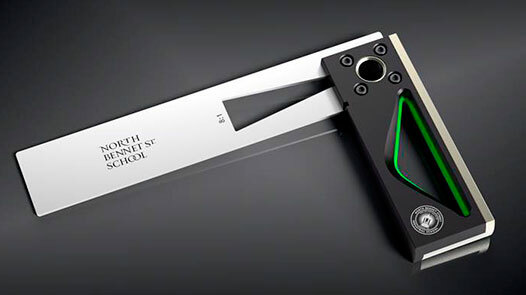 The tool is 6.5” long, just under 4” in height and features a stainless steel blade with an 8:1 internal cutout for laying out dovetails. The innovative handle design interjects a fun combination of colors giving it a unique voice in the tool world. Individuals who contribute $250 or more, receive the NBSS square. For contributions of more than $400, supporters receive both the tool and a copy of the exhibit book. If you’d like to help support this worthwhile exhibit you can make your donation here. Donations over $75 are tax deductible and if you work for a larger corporation you may want to see if they have a donation matching program. At my current day job, and my last job as well, they will match any donations I made thus effectively doubling my contributions. I encourage you to do the same if possible. I’ve already made my donation and eagerly await my new tool and book. I also look forward to seeing you at the exhibition. 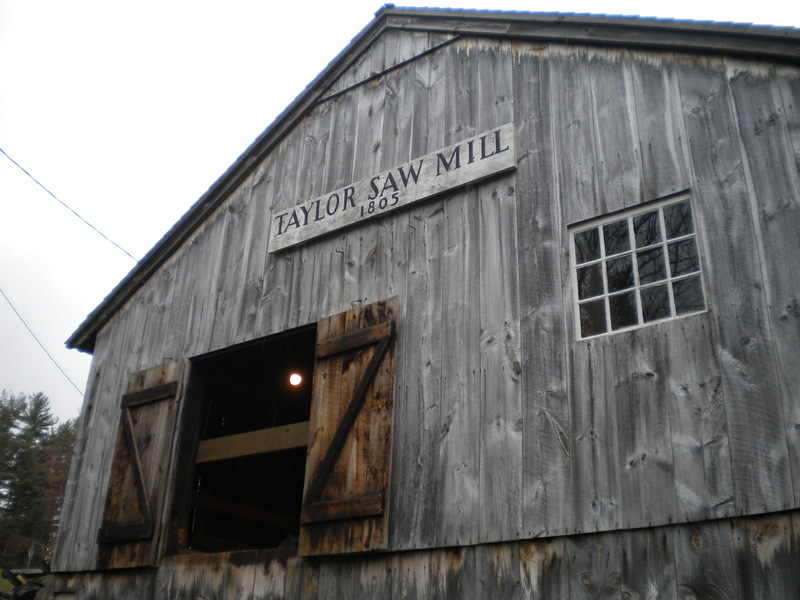 One of the hidden gems of Derry NH is the 200+ year old Taylor Sawmill. It’s one of the last surviving and working up and down sawmills in the region and likely the country. Powered by a large water wheel, this mill still operates for demonstrations and the occasional bit of restoration work. It’s amazing to see and hear this mill in action. There is a distinctive noise as the saw makes each powerful stroke like clockwork, and it’s almost scary as you can feel some of the vibration through the floor and feel the air move as this massive timber frame saw blade oscillates up and down. The mill is powered by a large water wheel which is fed by an adjacent pond. The blade itself is held in tension by a massive timber frame. You can think of it as a giant frame saw. The blades could be changed based on the type of materials being sawn and desired finish quality results. In the video below you’ll see the mill operating at one of its slowest speeds. Each blade was set and sharpened by hand. As the saw cut the timber, the ratcheting mechanism (driven by the massive geared wheel in the bottom left of the photo below) advanced the entire timber into the blade via a moving carriage. 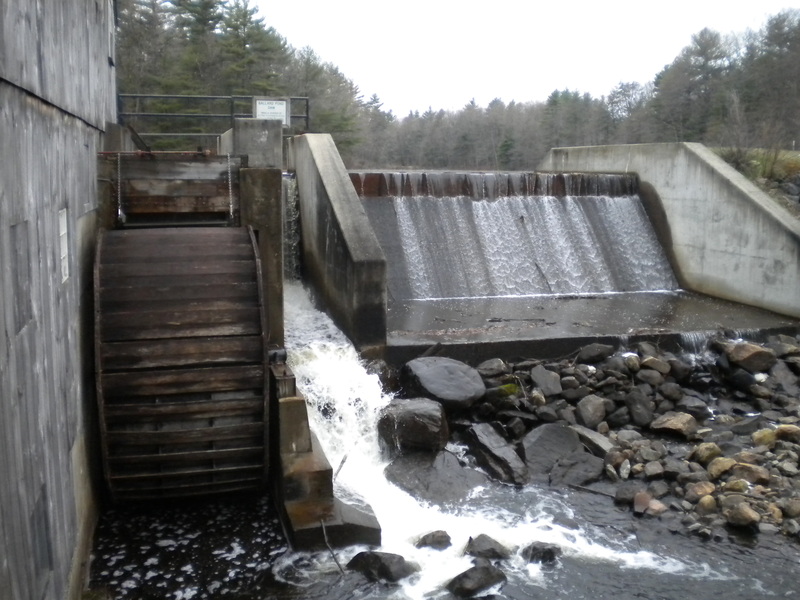 The mill itself sits on land in Derry NH purchased by Robert Taylor in 1799. The mill started operating in 1805 and had a fairly long service life. The mill site and 71 acres around it were purchased in 1939 by Ernest Ballard. By that time the original mill itself had been scrapped. 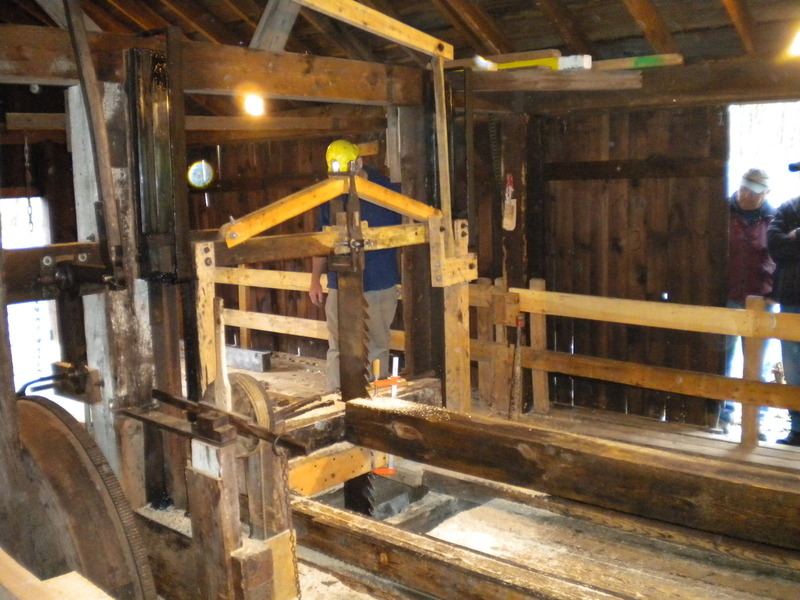 Ballard eventually found a similar up and down sawmill in Sandown NH and moved it to the Taylor site. 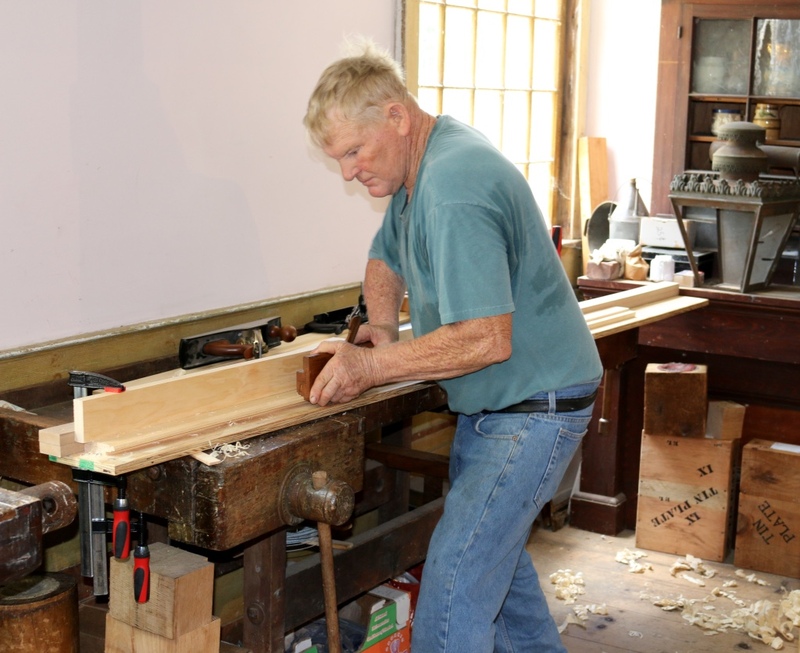 Ernest and his wife spent several years restoring and rebuilding that sawmill. He had to make the missing parts and track down a viable water wheel. Thankfully he persevered and was able to complete this project. In 1953 he donated the mill and 71 acres around it to the state of NH, thus creating Ballard State Forrest. Back in 2010 I visited the mill with a class of North Bennet Street School students and took several photos and videos which I have edited together into a YouTube video that you can watch here which includes the water wheel and saw cutting a timber. It was an incredible sight to see, and a great place to have a picnic or do some kayaking. If you are in the area, please check it it out. You can learn more about this mill and plan your visit by visiting it’s official web page here and the Wikipedia entry here. 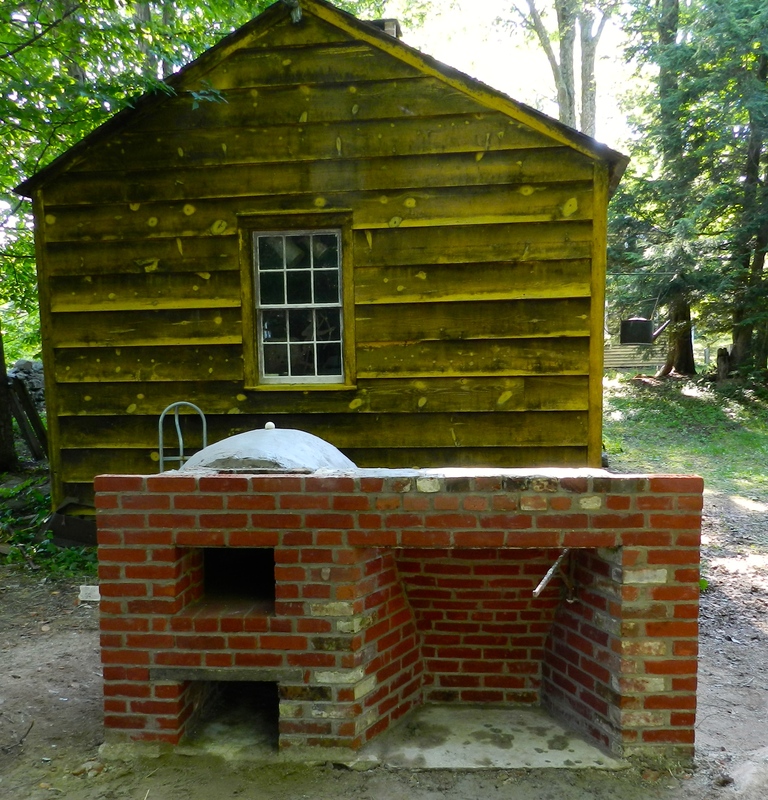 Have you ever wanted to build your own fireplace and beehive oven? It’s not for everyone, but it is something I’ve wanted to tackle for a long time. I’ve talked to a few masons, read all the new and old masonry books I could find, but still didn’t feel comfortable building my own. I could not find a good source that showed the end to end process. I also don’t want to end up burning my house down. To rectify this situation I figured I’d take a trip back in time. I just got back from spending a week at Historic Eastfield Village in Nassau NY (not far from Albany). If you’ve never been to Eastfield Village it’s a restored colonial village full of buildings and artifacts from the 18th and 19th century. What’s great about the village is that it is a hands on preservation laboratory where you can stay for free in the tavern and live with all the antiques and artifacts that are normally behind glass in a museum setting. What’s the catch? Well you are living as they did in earlier times. There is no electricity or bathroom. You live by candlelight — make sure to bring white taper candles — and you can cook your meals in one of the many fireplaces and ovens. After a long day of working out in the village it was a lot of fun to have a meal in the tavern, have a drink and play some tavern games by candlelight. Some folks were carving wood, some we playing dominoes with Billy’s ‘Eastfield Rules’ and others were enjoying a good conversation with folks from another part of the country. Staying at Eastfield is always a memorable experience. 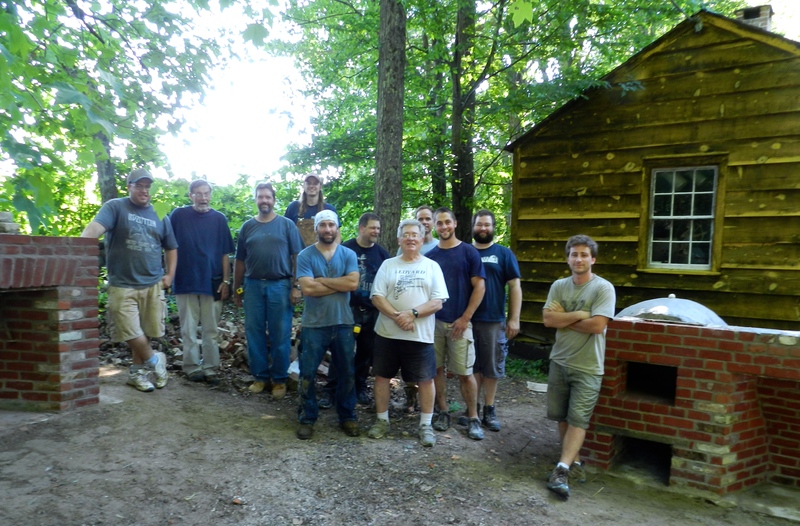 This 5 day class on building a traditional brick masonry fireplace and beehive oven was a special request from me and was filled with students and alumni from the North Bennet Street School’s Carpentry and Preservation Carpentry programs. We used all hand tools much as our forefathers would have used. Mortar mixed by hand with a hoe, bricks cut by hand with brick hammers — making some brickbats as we went, rubbing the face of a cut brick on a stone, setting and pointing with trowels and testing your work with levels. As I am predominantly a woodworker it was interesting to learn the skills required to tackle this project and as the week went on you could see the class pick up speed and some finesse. And I’m sure the next project we work on will be even better. The class was taught by my friends Bill McMillen, his son John McMillen and Don Carpentier who is the founder of Eastfield Village — the village is set on his father’s ‘East Field’ and is Don’s long time home. Billy is also a master Tinsmith and preservationist having worked/taught/lead the preservation efforts at Old Richmond Town on Staten Island NY, taught at the Tinsmith Shop at Colonial Williamsburg and countless other venues. 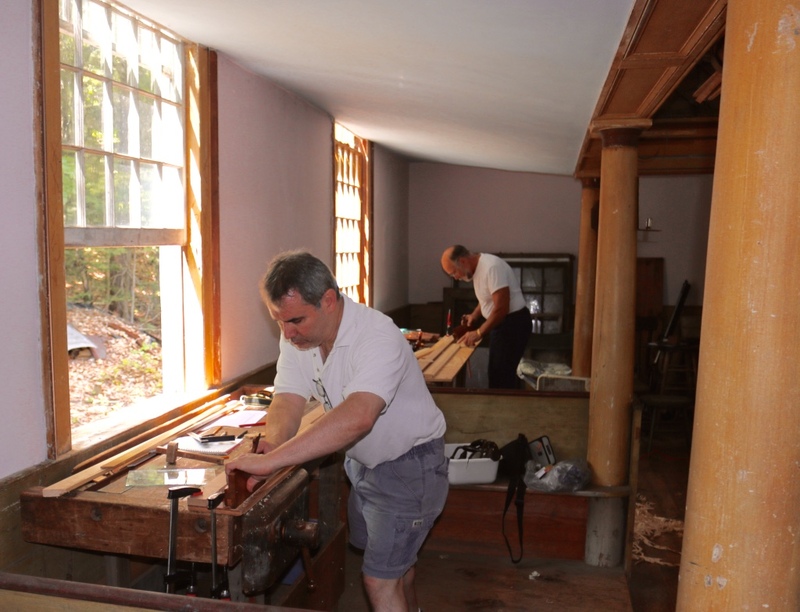 Don Carpentier moved and restored all the buildings in the village — an incredible undertaking and is also a well known historian and craftsmen having worked in wood, tinsmithing, blacksmithing and pottery. Don is also well known for his incredible Mochaware. John grew up around all this and is a skilled craftsman working in the NYC area. You can also learn more about Eastfield Village’s current class schedule via their website here and the village in general via this nice video from Martha Stewart that you can watch here. If you can make the trip out to Eastfield Village for a class I highly encourage you to do so — it’s an experience you will never forget. Things have been quiet on the blog front the past few weeks. Some folks wondered if I was kidnapped or worse. Thankfully I am safe and sound, though exhausted. I’ve been working 12+ hour days for the last three weeks straight at the day job. My volunteer night job has been developing a new website for the Early American Industries Association which is one of the oldest and most prolific groups of its kind. Any spare moments beyond that have been spent in the shop or preparing the baby’s room. I’m proud to say that the new EAIA website has been online for a few weeks now and you can check it out here. It offers a new more modern feel and is built on the WordPress platform. My hope is that we can get more folks involved — especially the next generation of tool and early industry aficionados. If you have an interest in blogging or would like to share some related content with the group (even if you are not a member) please contact me here. If you are not already a member I highly recommend checking out this great organization. The two major publications — The Chronicle and Shavings alone are worth the cost of membership. You can find many other like minded folks who are into traditional hand tools, techniques and the study of industries that helped shape America. The EAIA is also known for it’s Annual Meeting and regional meetings. 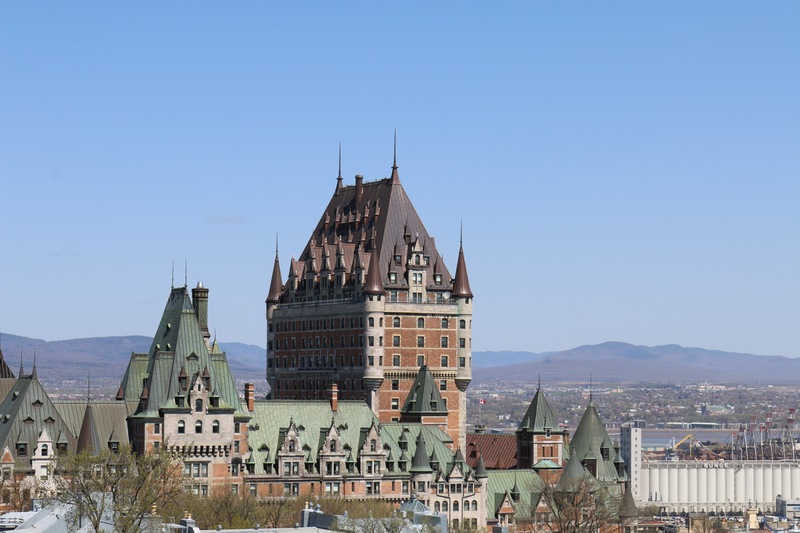 They are a great opportunity to visit new areas and museums, get a behind the scenes look at a given venue and socialize/network with like-minded friends. You can see some highlights of last year’s meeting in my earlier blog posts here. 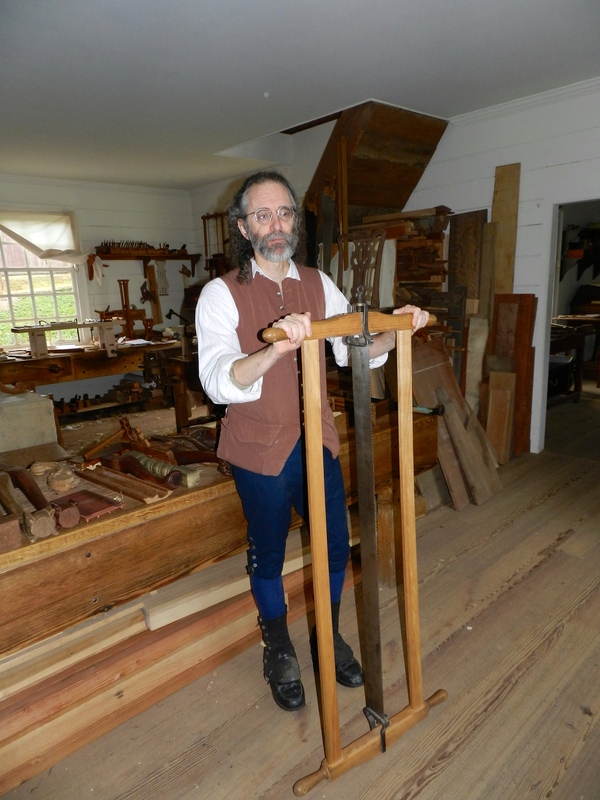 This year’s meeting theme is ‘Tools for the New Frontier: 1790 to 1840’ and will be this coming week in Pittsburgh PA. Highlights will include visiting the Heinz Center, Old Economy Village, the Fort Pitt Museum along with the usual EAIA events of the tool swap, tool auction, whatsits? and many mixer events. If you are interested you can learn more here. P.S. I’ve been busy working out in the workshop and after the conference will be posting some updates on what I’ve been up to. Stay tuned. 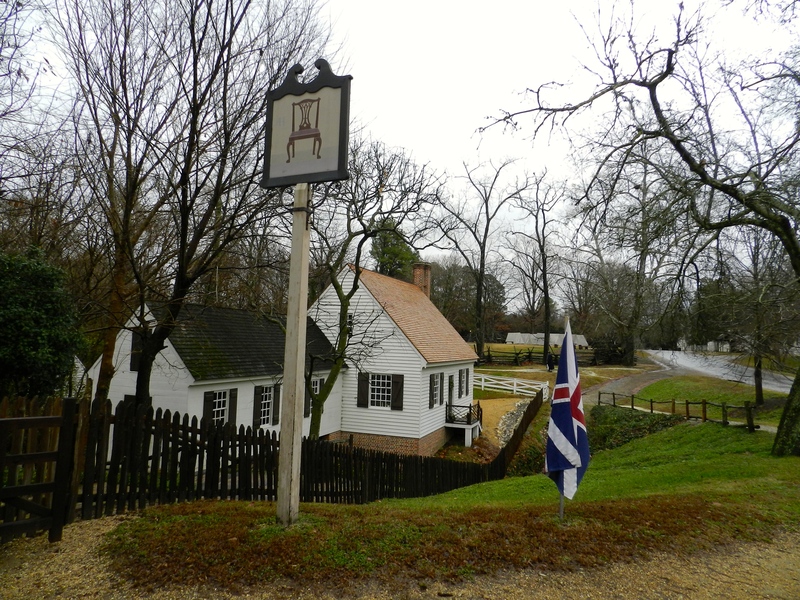 Back in December 2013, I topped off the Mr. Fusion, warmed up the Flux Capacitor and headed back to the 1780s for our annual pilgrimage to Colonial Williamsburg Virginia. During this visit I wanted to check out some of the frame saws my friends are using and what they thought about the saws ahead of building my own. In talking to my friend Ed Wright, the master Harpsichord Maker in the Hay Shop, he showed me some of the finer details of the larger saw shown below. The saw’s size and details were derived from Roubo’s plates. The hardware was forged by Colonial Williamsburg’s Blacksmiths, not to be confused with Williamsburg Blacksmiths up in Williamsburg MA (I bought my hold fasts and log dogs from the former, and barn hardware from the latter and I am very happy with both). You can see the forged eye bolt below, passing through a threaded square section and pressing against a metal wear plate. 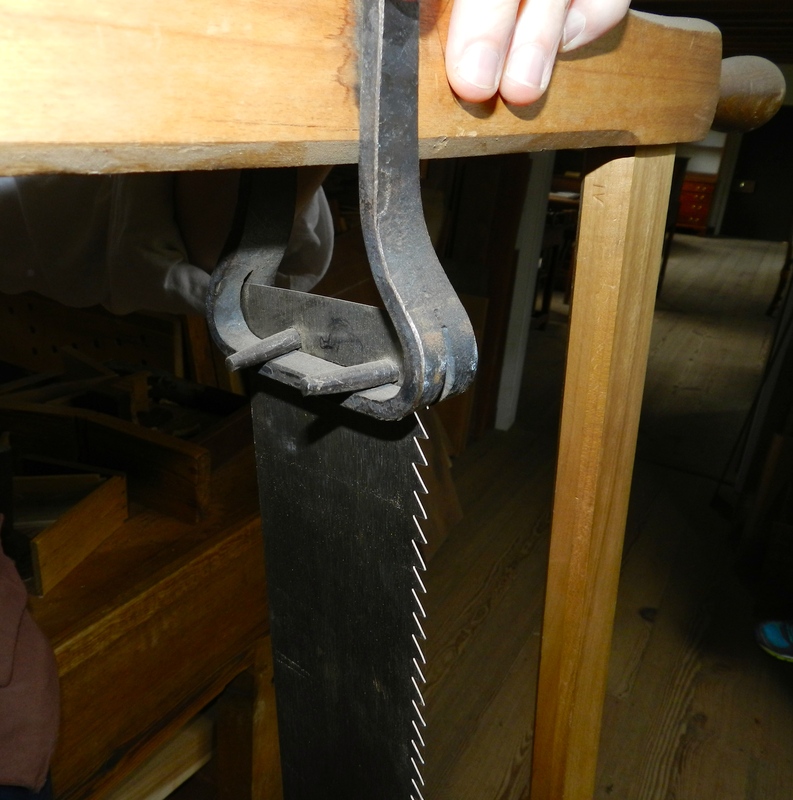 The saw deviates from the Roubo plate a bit with the offset turned handles shown below. (Check out Don’s post here — which includes a copy of the plate I am referring to and is related to the recent LAP reprint of Roubo on Marquetry which includes a nice translation of this plate and Don’s experiments with his own reproduction saw) Ed said that the turned handles worked well over the years even if they give the saw a slightly more modern (Say 19th century) appearance compared to the simple carved volutes in the Roubo print. If you were to use this saw all day long vigorously sawing fine veneers I could see wanting this sort of turned handle and it seems to be popular in other reproductions I’ve seen. While the carved volutes seem like they’d be tougher on the modern sawyers’ hands I suspect the likely simple volutes were contoured to fit in the sawyers hand and would have forced him to have a lighter grip on the saw which might have allowed him to react more directly to the wood and make fine adjustments as he goes. From examining Figure 10 of the Roubo print it looks to me like the sawyer on the right has a very light grip and is sighting down the saw to gently steer it on an appropriate course as the the left sawyer is sighting as well as pulling the saw through the cut. Don’s translation talks about the advantages of sawing on a slight incline and lifting the saw on the return stroke to clear sawdust and not bind the saw. Sawing with a second person can be like having a dance partner — if you are in sync and can communicate well verbally and non verbally you have a shot, if you are out of sync things can go south quick as the narrow blade is unforgiving and wants to follow the path of least resistance. The saw blade is held in place via pins that are held in tension, thus tensioning the blade. The blade shown here is quite wide, though not quite as wide as the ~4″ Roubo suggested. When using this type of saw you need to be careful not to over tension it as you can deform/stretch the holes in the blade. The impression I got was that this saw was a little slow cutting at times. A lot of folks online have experimented with saw tooth geometry and similar variations. 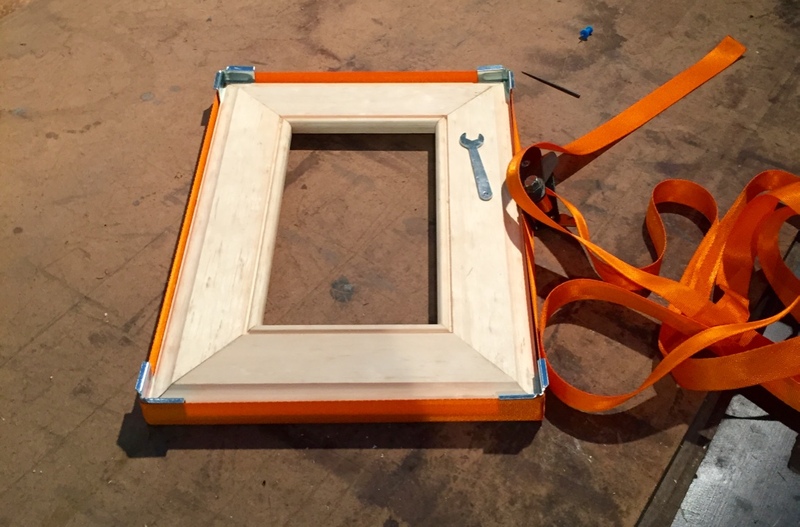 Adam Cherubini had an interesting and somewhat controversial post regarding his experiences with frame saws which you can check out here. (Be sure to read the comments as several other folks who have been experimenting in this space weighed in). 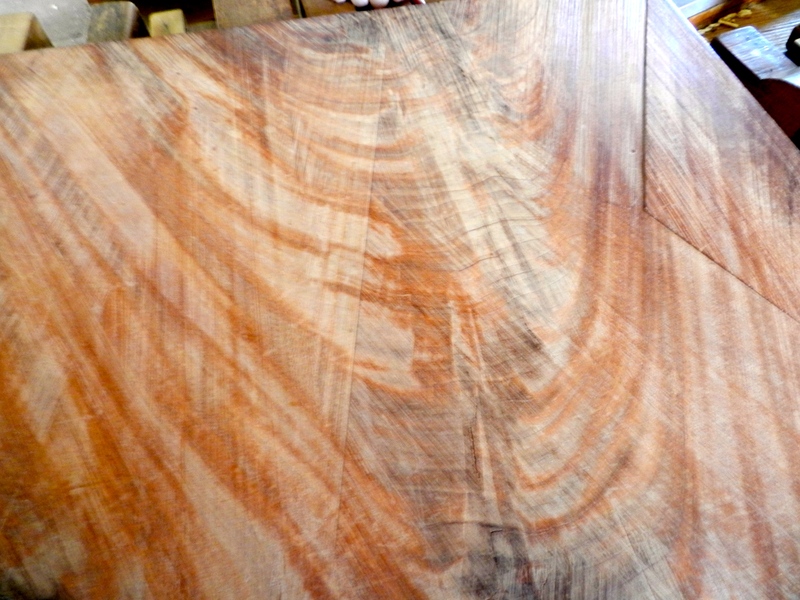 When using a frame saw to re-saw planks or make veneers you can see some of the telltale marks of the tool as it slices through the figured wood. (See below). In general the blade wants to follow the path of least resistance, so cutting in with another saw to start as Roubo describes or using a ‘kerfing plane’ as Tom Fidgen suggests are great ways to better your chance of success. 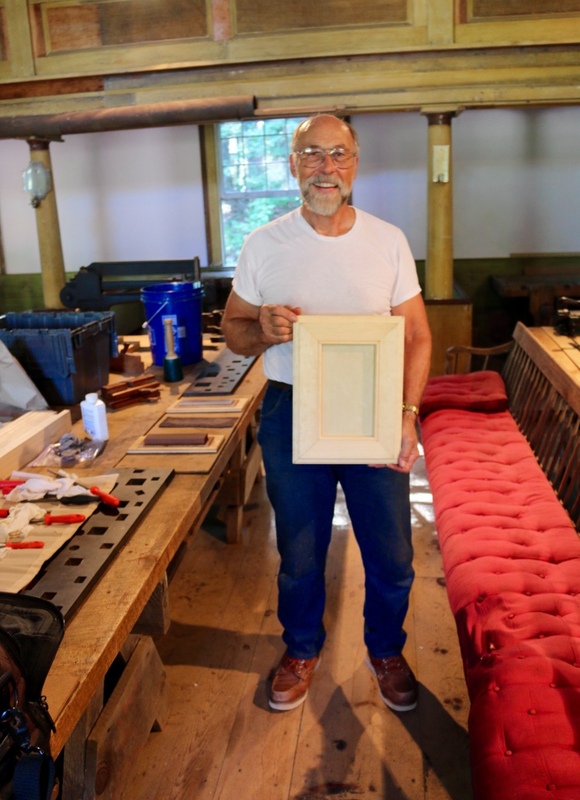 If you’ve seen any of the many great projects to come out of the Hay Shop you’ll have no doubt Ed and the others in the shop have mastered many uses of the frame saw. 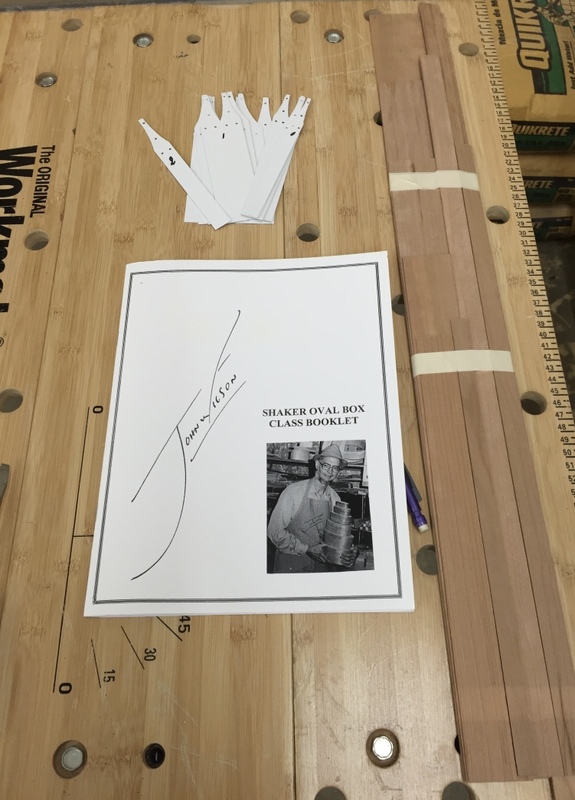 My next stop was to visit Master Carpenter Garland Wood in the Joiner’s shop. Every time I visit I want to pull up a bench and take up residence in the shop as another member of the crew. The benches, tools and projects all feel like home. In the Joiner’s shop Garland showed me the frame saws he had on hand in the shop. 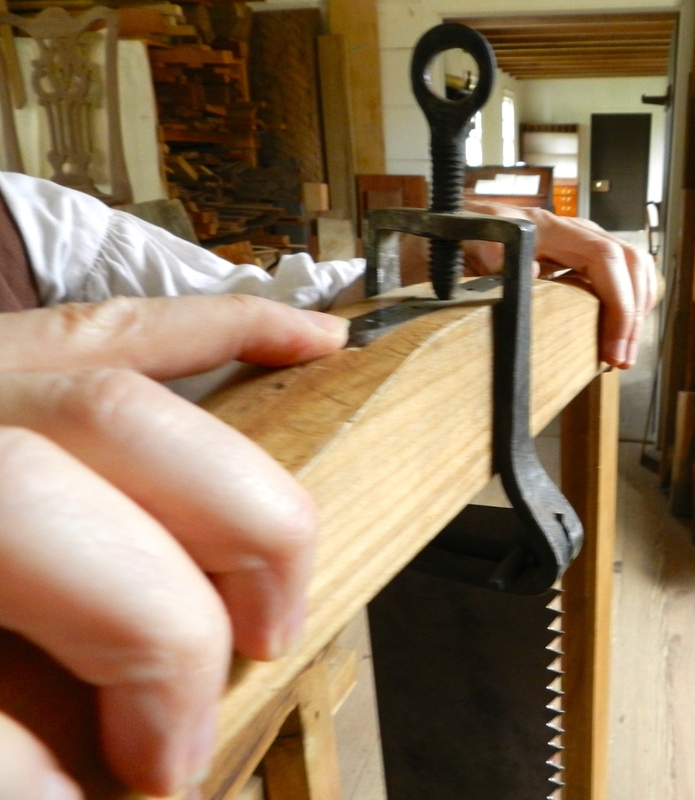 Shown below is a nice felloe saw with its narrow blade used to cut curves. 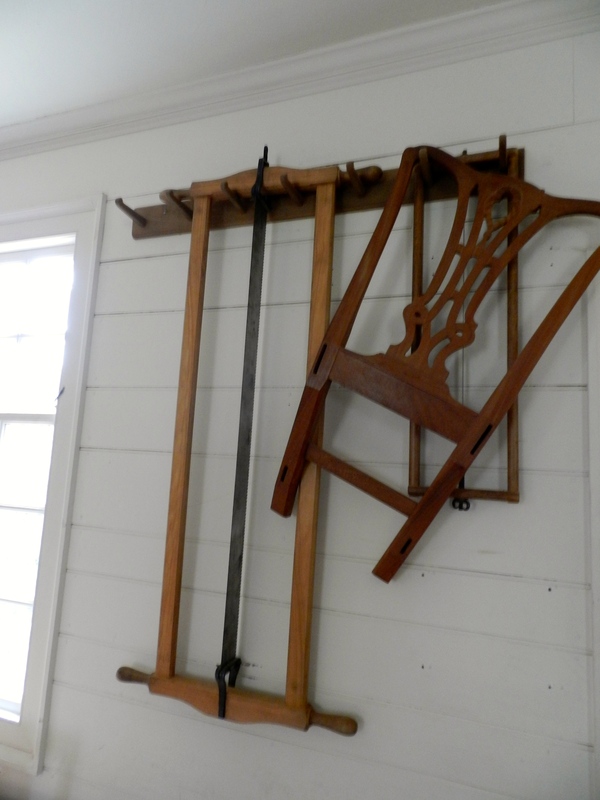 In the wheelwright’s shop you can see some larger versions of this style of saw. The example below has nice delicate lines, a simple volute detail, and nicely wrought wing nuts on both ends of the saw. 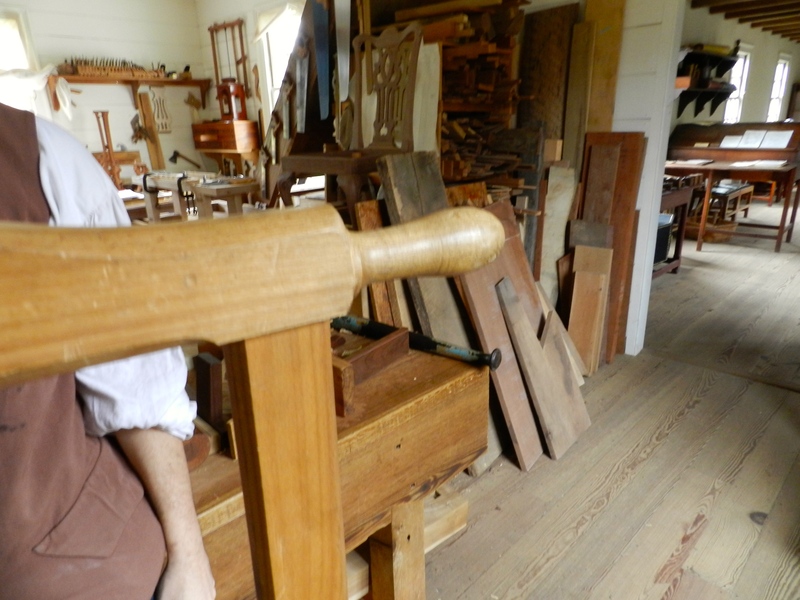 In the foreground of the photo below you can see a tiny bit of a simple bow saw which we’ll talk about in a future post. 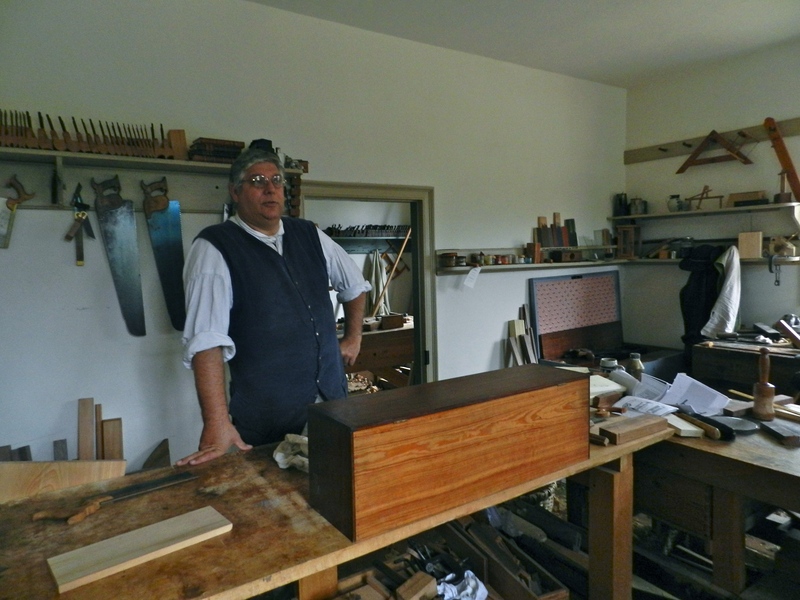 There are very few places you can drop by and pick the brains of talented folks who share the same level of enthusiasm for traditional woodworking and sharing the craft with others — Colonial Williamsburg is one of those places. I’m thankful to Ed and Garland for their time and advice. I look forward to putting some of it to use in building my own frame saw. P.S. I’m of the mindset that we still have more to learn about these saws and look forward to experimenting a bit with my own. I ordered the first production frame saw kit blade from Bad Axe Toolworks based on a saw from Tom Fidgen’s Unplugged Woodshop and will be posting about that in the future. 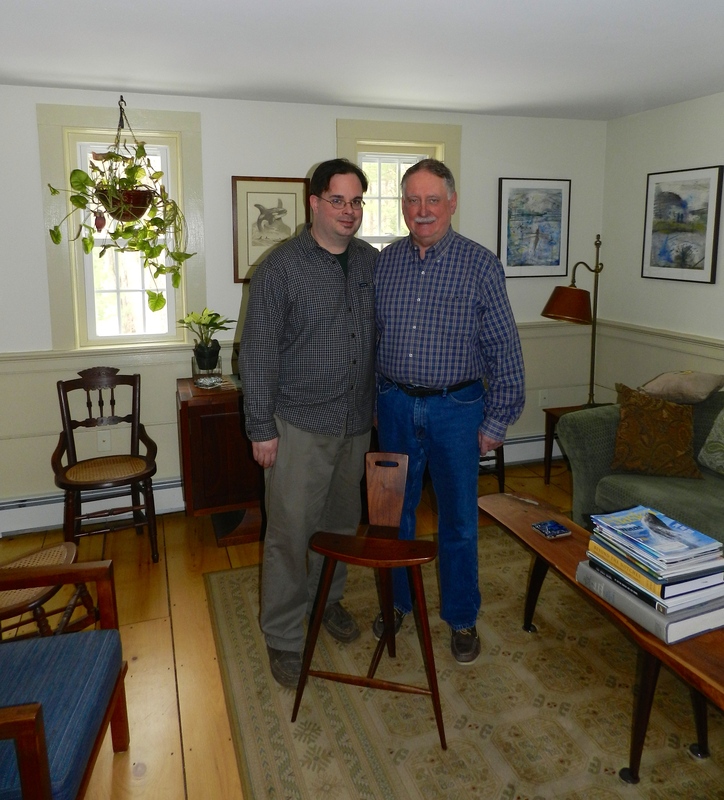 This past weekend I had an amazing opportunity to visit the home of Peter Frid — Tage’s son, and visit with his family. Beyond seeing some of the many items Tage made it was great to hear stories of what life was like with Tage and Emma from Peter, his wife Kathy, their son Oliver and his wife Cherie. I was very exited to see Tage’s iconic 3 legged stools in person — building a pair has been on my mile long todo list since I first learned about them years ago. 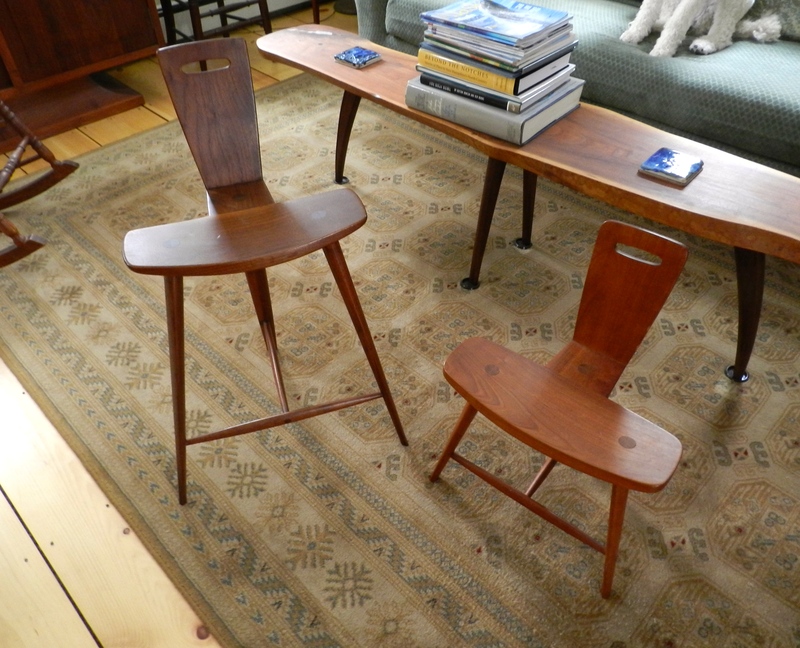 I tried unsuccessfully to see these chairs at the MFA and RISD museum but every time I went they were not on display. Not only did I get to see them, but I got the chance to sit on one of them as well. The stool is very stable and surprisingly supportive given its seemingly diminutive stature. It was also just as comfortable to sit in it facing forward as it was to sit in it backwards. I had read the story about how Tage came up with the idea for the stool while sitting on a fence at a horse show, but it was neat to hear that the reason Tage and Emma were at the show was because Peter and his sister were riding in that very show. Also shown in the picture above is a very nice natural edge coffee table with inlaid metal that is seen in the Gallery section of Tage’s 3rd book. 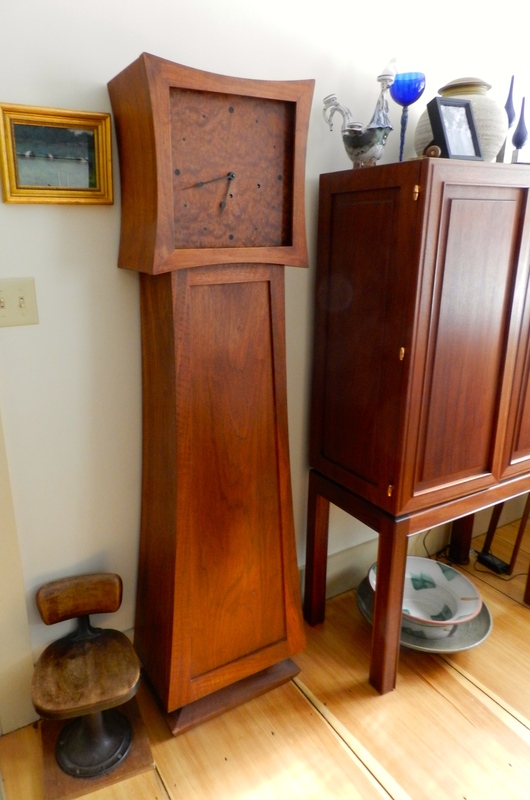 In another room was Tage’s famous ‘Grandmother Clock.’ The black and white photos of Volume 3 of Tage Frid Teaches Woodworking do not do it justice as the wood has aged beautifully. Inside the case are all the traditional polished brass movements you would expect to find in a large case clock. 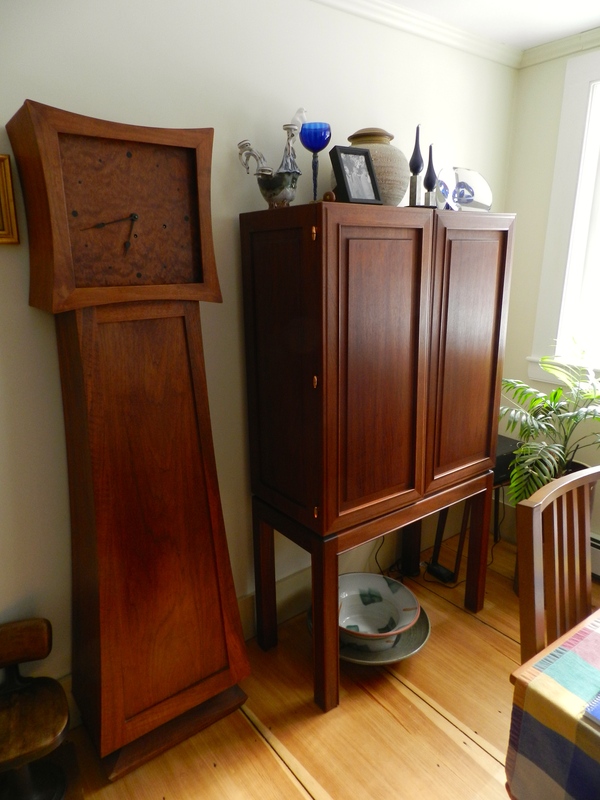 Adjacent to the clock is a beautiful liquor cabinet that is also from the Gallery section of Volume 3. It is made from mahogany and the panel details on the side and top are carved in. The cabinet also has beautiful copper/bronze hinges that pivot on an egg shaped knuckle. Shown above and below is Tage’s favorite chair to sit in. 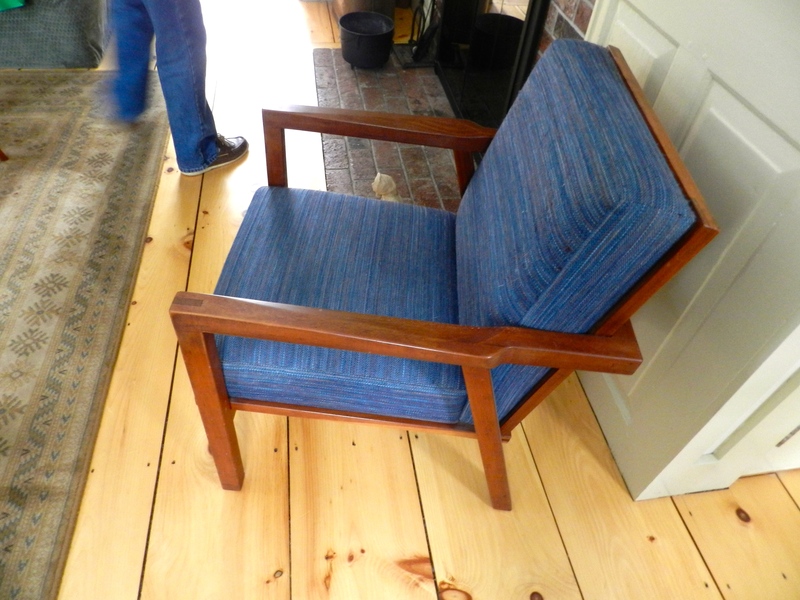 With clean lines, expressed construction, and thickly upholstered cushions I can see why he liked this chair a lot. 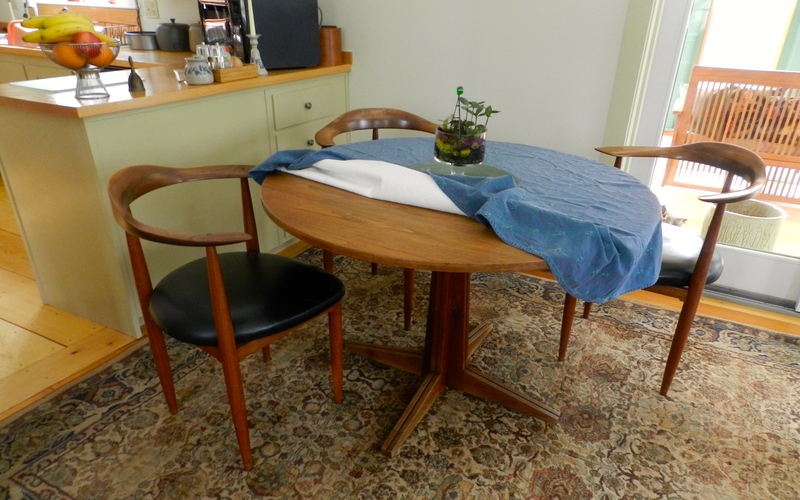 Like most Danish modern furniture the lines are clean, the details are subtle and piece has a visually light feel. The profile view reminds me of some cues from a morris chair and the forward lean of the legs reminds me of some of the chrome accents on cars from the 1950s — even while standing still it wants to be moving. 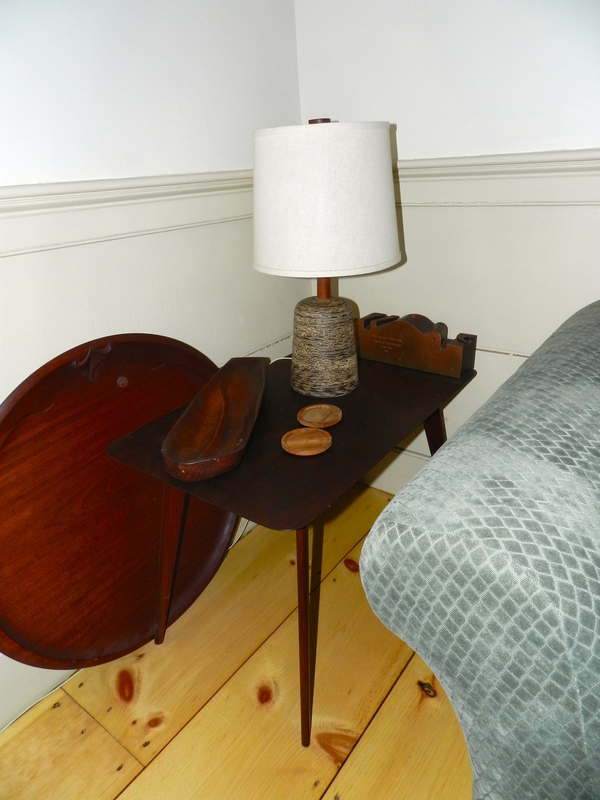 The end table above has another great story behind it. In some of Tage’s writings and articles he mentioned the rocky start he had when first arriving at the School for American Craftsmen wherein the facilities were not well setup and some folks were not eager to hear what Tage had to say. One morning while the students were attending lectures with another instructor Tage took a large board and started milling and working it. By mid-day he finished construction of the table and by the end of the day he even applied a scraped lacquer finish. This feat caused quite the sensation at the school and suddenly a lot more folks wanted to hear what Tage had to say as the existing way the program operated would have taken about 2 weeks for students to carry out this work and with inferior finish results. (You can read more about this story and many others in the Smithsonian interview of Tage Frid available online here.). The table has a delicate look that was ahead of its time and has aged well. In the above photo you can see the circular pedestal pull out table Tage made in Chapter 4 of Volume 3 of his book. The table base has some interesting design details that hide where the table expands from. 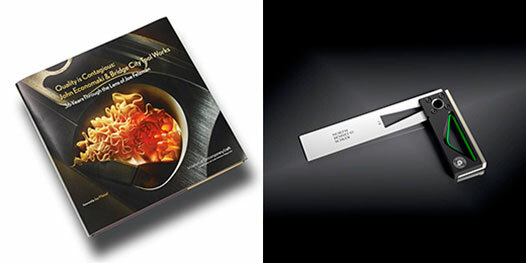 The book details the intricate and interesting sliding mechanism that supports the removable table leaf. Also shown are some corner chairs with upholstered seats. They are comfortable when sitting upright and support you well even if you sit with a more relaxed or slouched posture. While not a cabinetmaker by trade I suspect the knack for woodworking and artistic creativity is in the genes as Peter built numerous very nice cabinets and built-ins around the house, including the kitchen cabinets and tops shown in the background of the above photo and a very nice computer desk. Oliver is an art teacher and accomplished painter and you can see some of his work here. Tage also did a fair amount of bowl turning especially in his later years. Above are a few samples of his turning work. 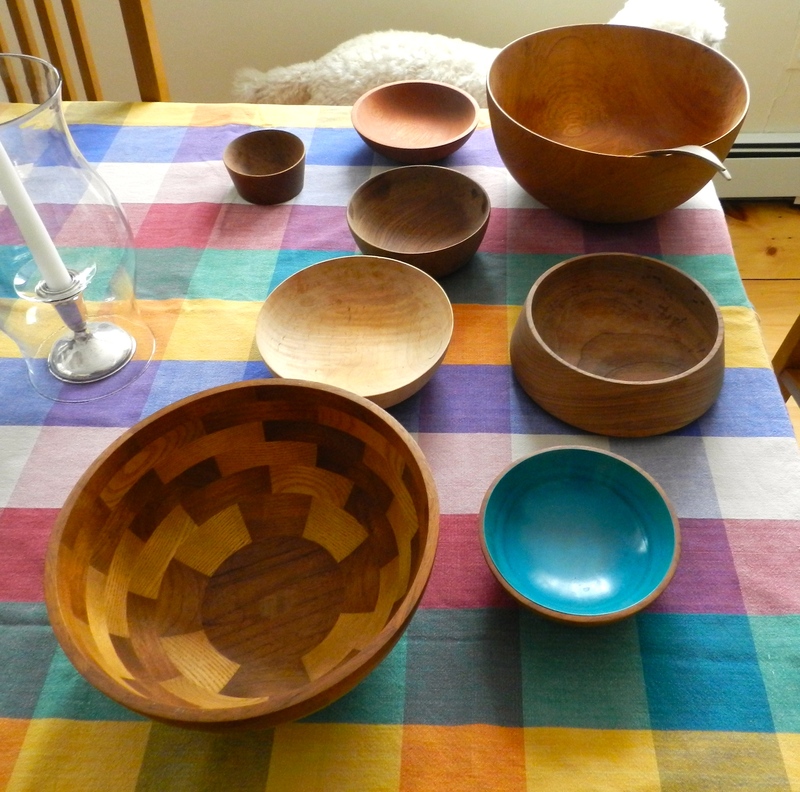 The large checkered/segmented bowl and blue lacquered bowl in the foreground were two of my favorites. The large salad bow near the top of the photo is also interesting. Rather than create a large tenon or undercut a tenon for use with a bowl chuck it seems that Tage used 4 wood dowels to presumably affix the large bowl blank to a faceplate or similar — thus maximizing the size of the bowl he could get from the blank and also allowing him to easily cut it off of the faceplate when the turning was completed. Pictured in this last photo are Peter Frid (Tage’s Son) on the right, and Oliver Frid (Tage’s Grandson) on the left. I want to thank Peter for opening up his home to me, a thank you to Oliver for the introduction and a big thanks to Kathy and Cherie and the whole Frid family for their hospitality and allowing me to poke around admire some of Tage’s work. It was an inspirational visit and reminds me how I need to get back out into the workshop and finish off my Frid inspired workbench. P.S. If you’d like to learn more about Tage Frid and his work, please check out my earlier post about him here. P.P.S I also got to see some of Tage Frid’s workbenches and will be exploring those more in a future post.